It rained all night and I awoke to thick mist as well. I lay nursing my hangover for a while until it stopped raining sometime around 9am. Camping in long grass full of cow pats when it’s wet is not advisable. I don’t know how I managed to pack away without too much incident. Everything was wet though: towel, smelly socks, underwear. I felt in desperate need of a decent campsite with short grass and a washing machine. I found Mark, Mark and Churchie from the pub last night and hung around with them, where I was treated to tea and a sausage and bacon roll. Just what I needed. They were nice fellas, and locals so good for a few tips on what to look out for. 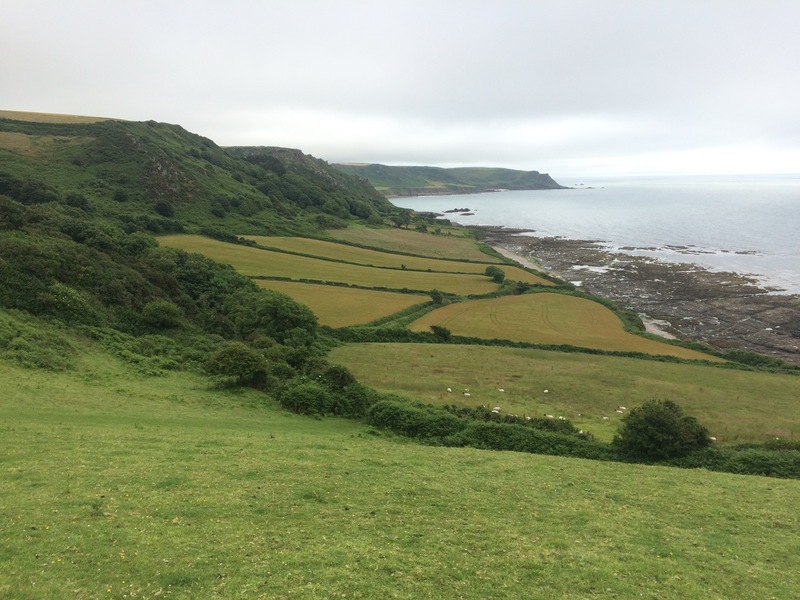 We watched the sea slowly appearing at the end of the field as the mist lifted. I finally packed my tent away at 10.30 and set off. Somehow I had avoided the lady who comes around the field collecting payment so I camped for free. 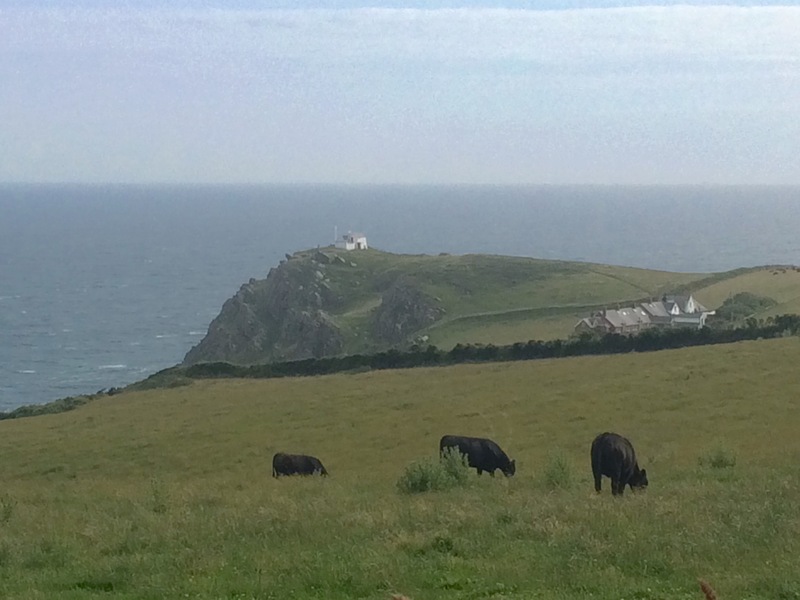 To be honest, the campsite wasn’t worth the £6 anyway for me, but great if you come with your own facilities, like BBQs, and toilet paper, or to crash after a night at The Pig’s Nose. 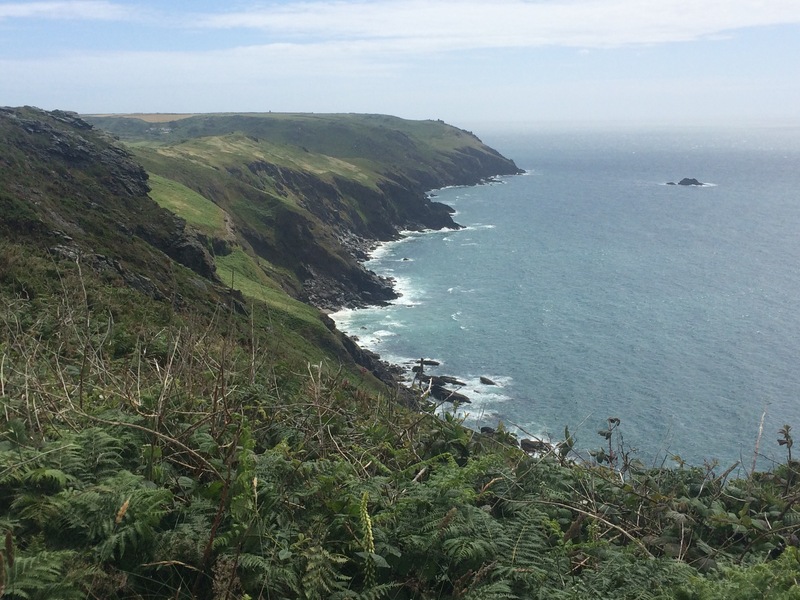 The walk around Lannacombe Bay and out to Start Point was lovely; much like yesterday with big cliffs and rocks. 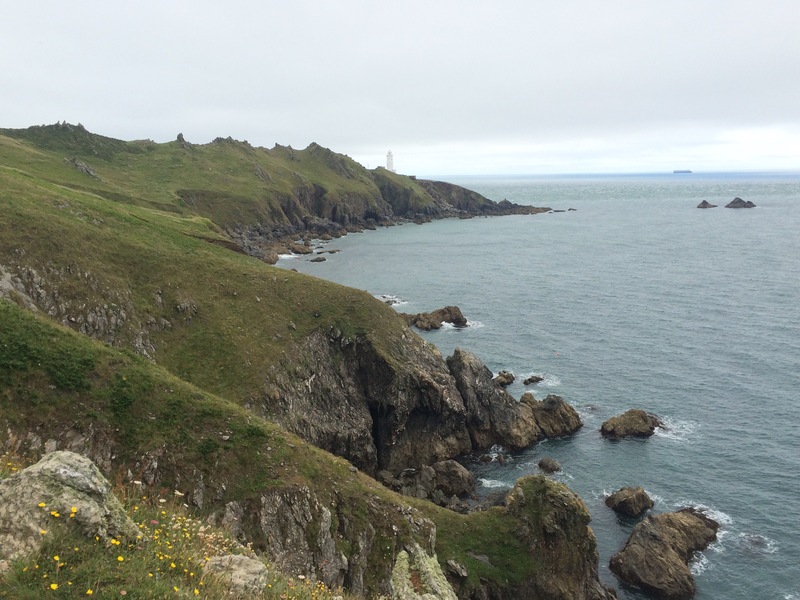 Start Point is impressive; it is an exposed peninsula running almost a mile into the sea. 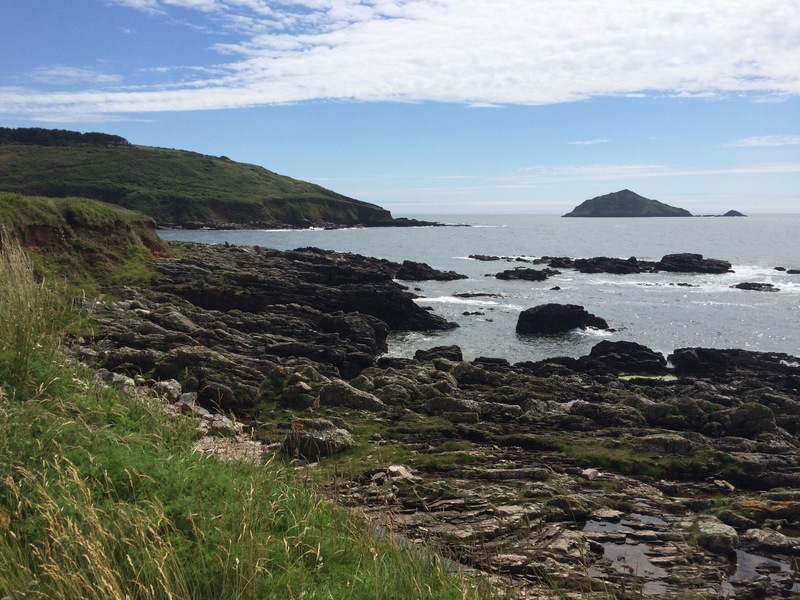 It is covered in jagged rocks and has a strong tidal race around the tip (it reminded me of Morte Point near Woolacombe in North Devon). Start Point is an evolution of the Anglo Saxon Steort, meaning tail. This was where I stopped walking in an Easterly direction and turned North. 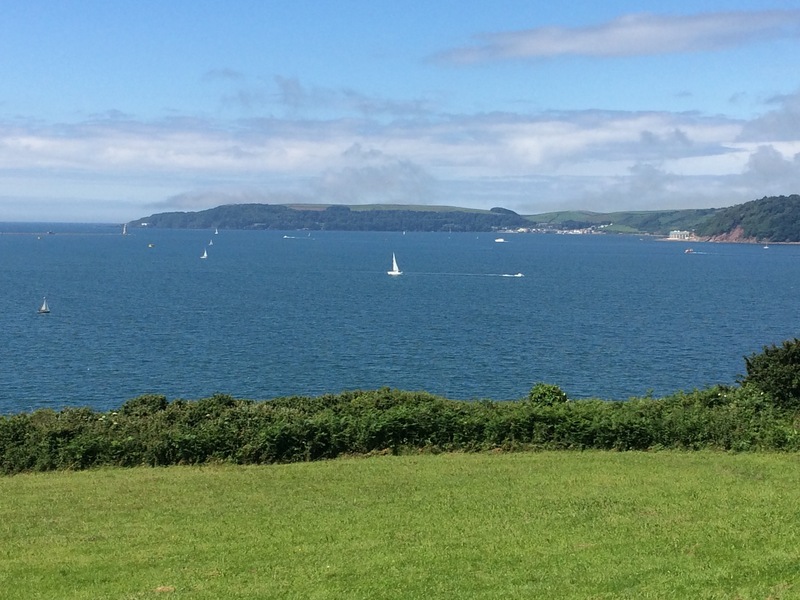 The sun was coming out and the sky turning blue, just in time for me to get some spectacular views right around Start Bay. 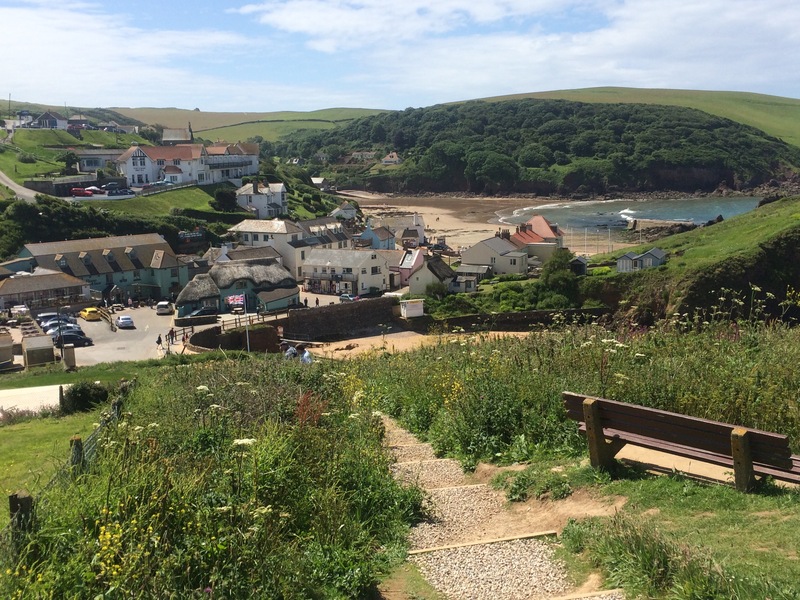 The village nearest to Start Point is Hallsands, at least what is left of it. 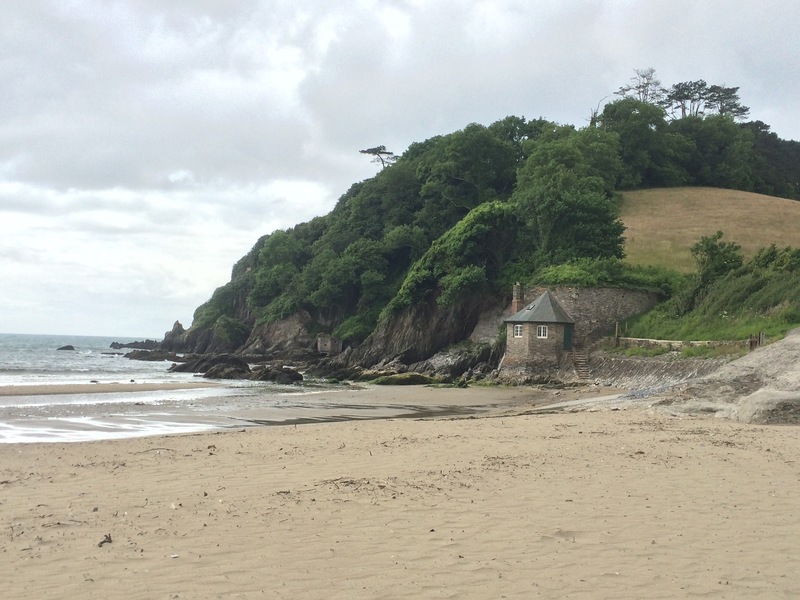 The lower part of the village was lost to the sea in a storm in 1917. Only one house remained intact but fortunately all the villagers managed to escape. 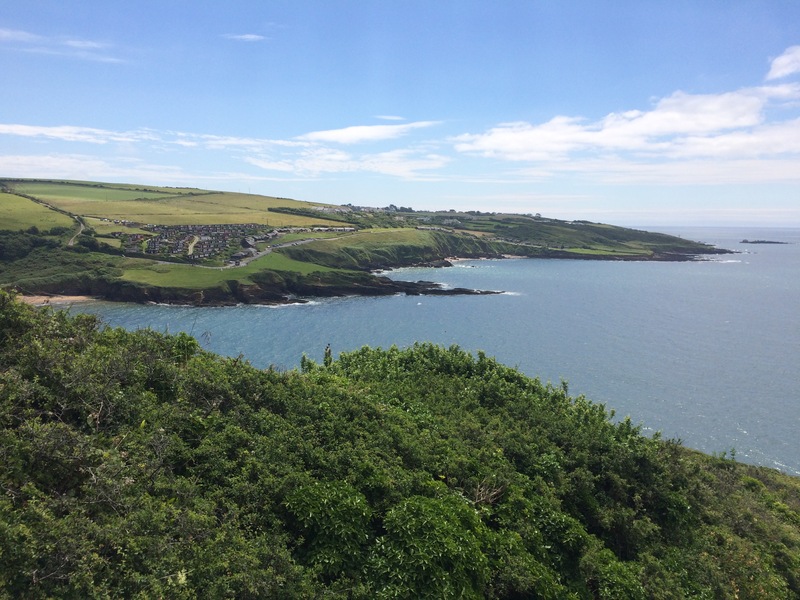 The ruined houses are still visible below the cliff and the sad tale of how “The beach went to devonport and the cottages went to the sea” is recounted on an information board. 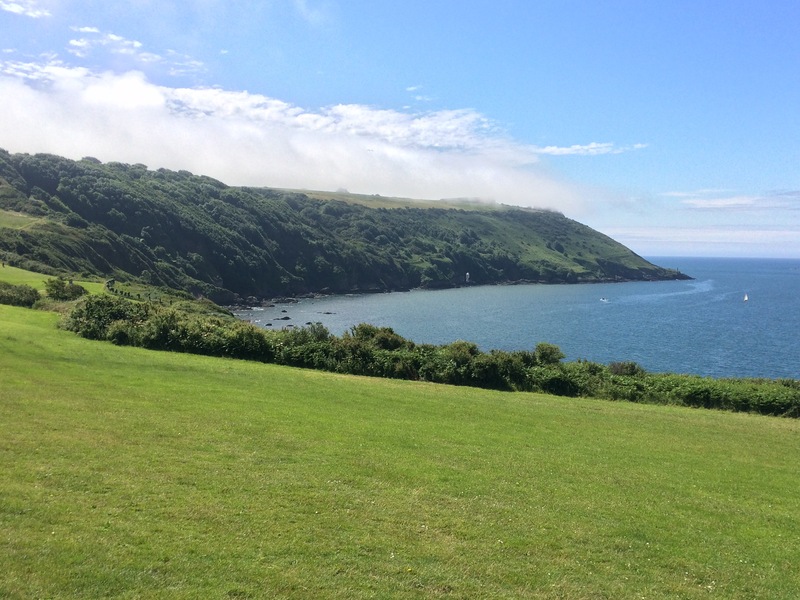 In essence, Hallsands was lost as a direct result of shingle being removed from Start Bay in order to enlarge Plymouth docks before WW1. The subsequent inquiry read like Hillsborough, and the villagers were never properly compensated. At Beesands I stopped at an excellent cafe/fishmonger/shop/restaurant. I was still feeling a little fragile but fish and chips on the seafront sorted me out. 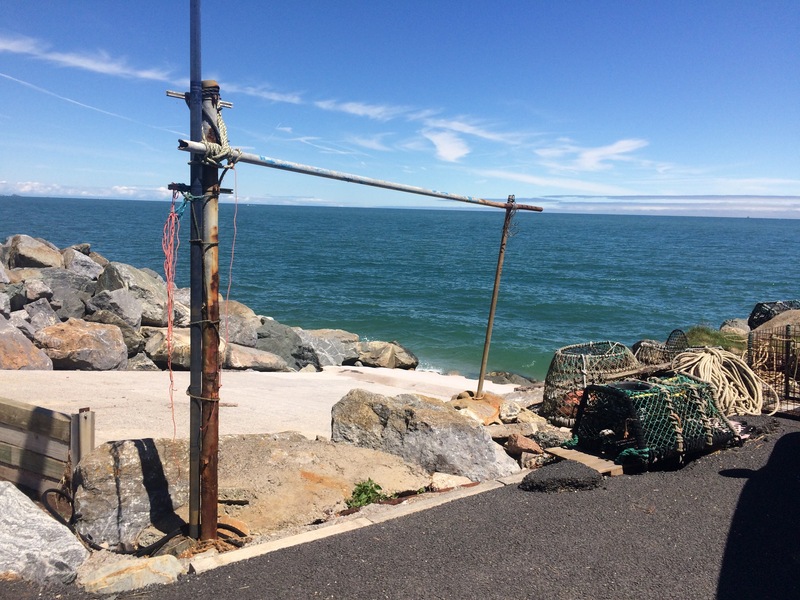 The owner of Britannia@thebeach operates his own fishing boat. 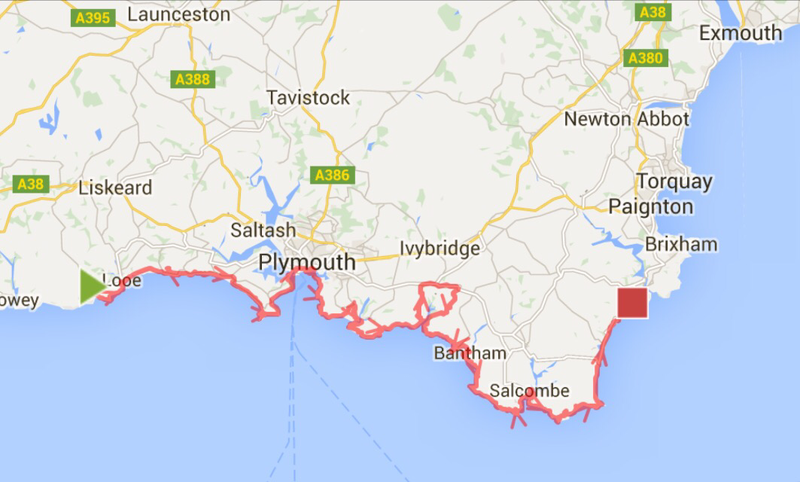 Apparently the stretch from Plymouth to Brixham is known as Britain’s seafood coast. 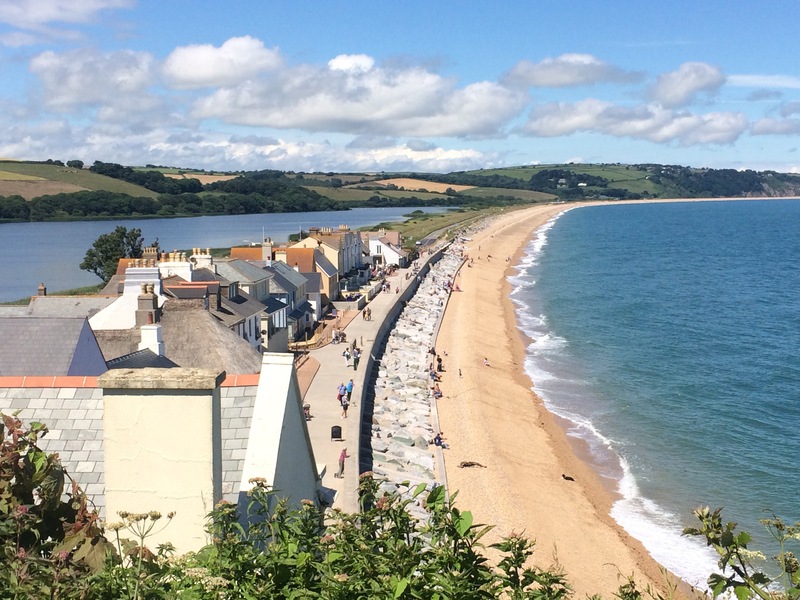 Torcross was the start of the long walk sandwiched in between Slapton Sands (a thin shingle beach) and Slapton Ley, a lovely lake. It was hot! 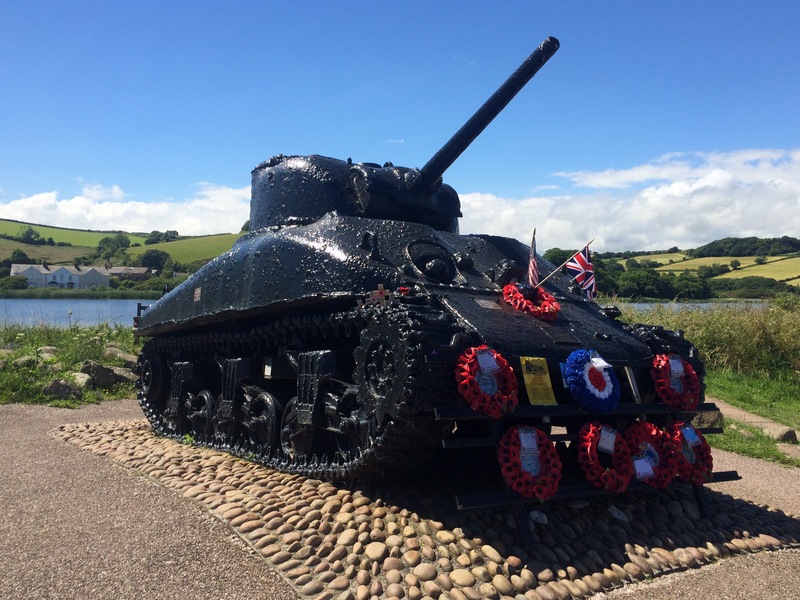 I took some time to look at the Torcross Sherman Tank that was recovered from the sea at Slapton Sands and now stands as a memorial to the 748 American troops who died here practising for the D-Day landings at Utah Beach (more than died in the actual assault!). The commanders clearly needed the practice! 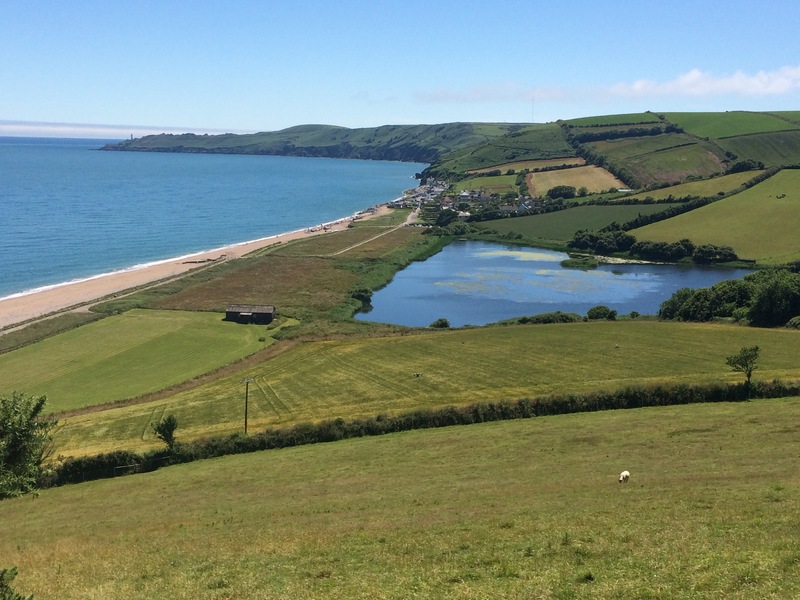 Slapton Sands was deemed similar to the Normandy beach codenamed Utah so in December 1943 the whole area (3,000 people) was forcibly evacuated to make way for the US Army. Locals had to leave their farms and livelihoods behind. 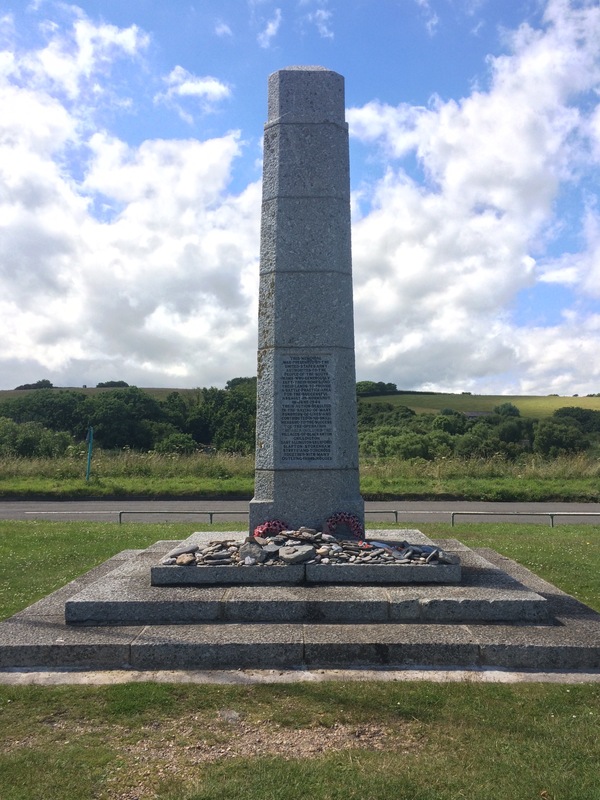 In recognition of this the US Army presented the people of South Hams with a memorial. 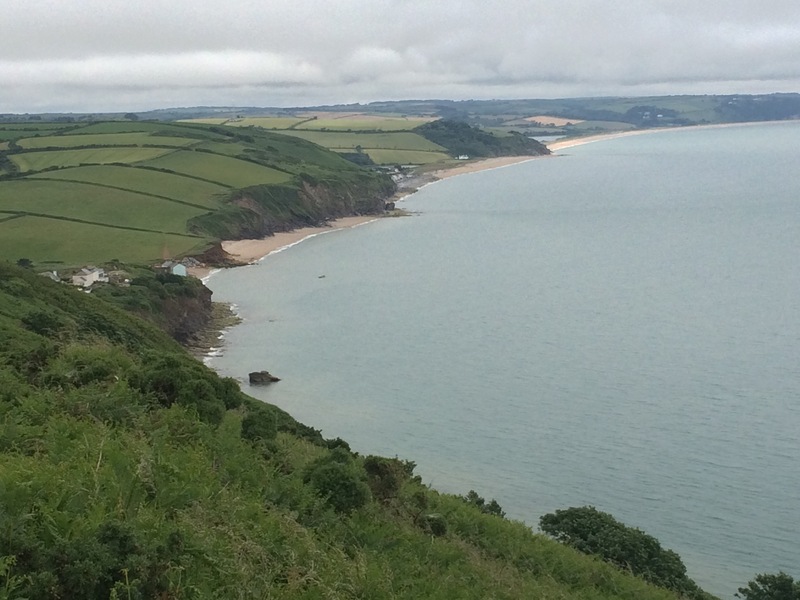 Immediately after Slapton Sands I had to tackle a couple of sharp hills, up to Strete, down to Blackpool (the other one!) and up again to Stoke Fleming. Blackpool Beach looked lovely, and not a donkey in sight! 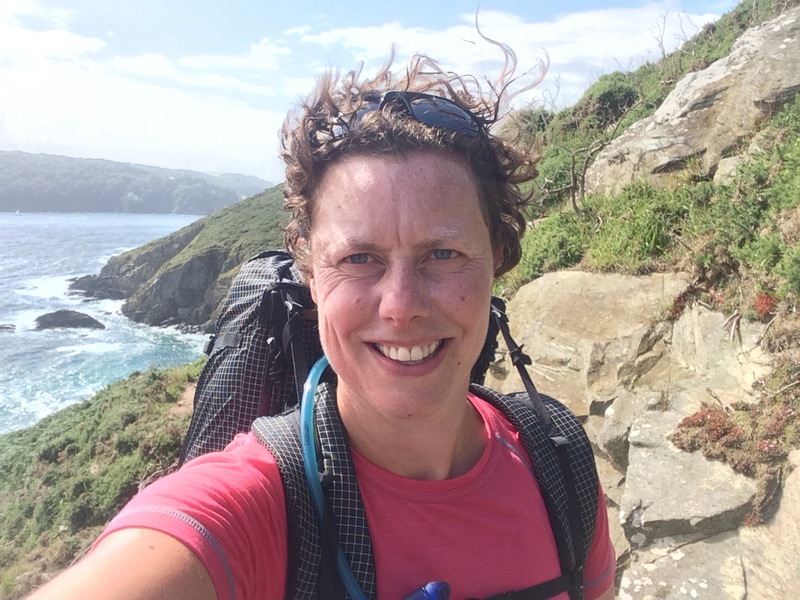 I was very relieved to be camping at a proper campsite, and it had a washing machine.The smell from my wet clothes was leaking out of a plastic bag in my rucksack. This was too much to bear. 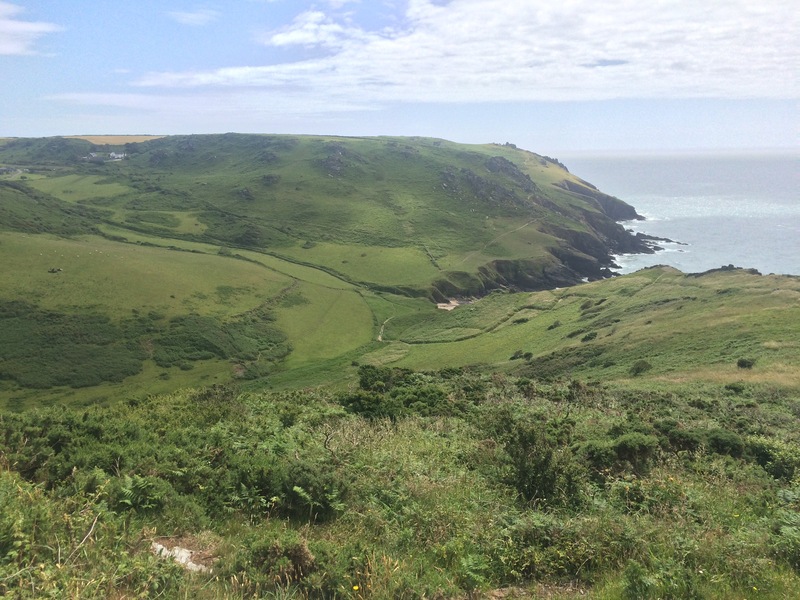 Naturally the campsite was on the uphill edge of the town so I had to walk back down the hill to The Green Dragon pub. It was worth it as their fish pie and beer were both excellent. I survived a very windy night (which I later found out from the Prawle Point Lookout Station was a ‘nearly gale’). The sun was shining as I packed away so I washed a couple of bits and hung them off my rucksack. 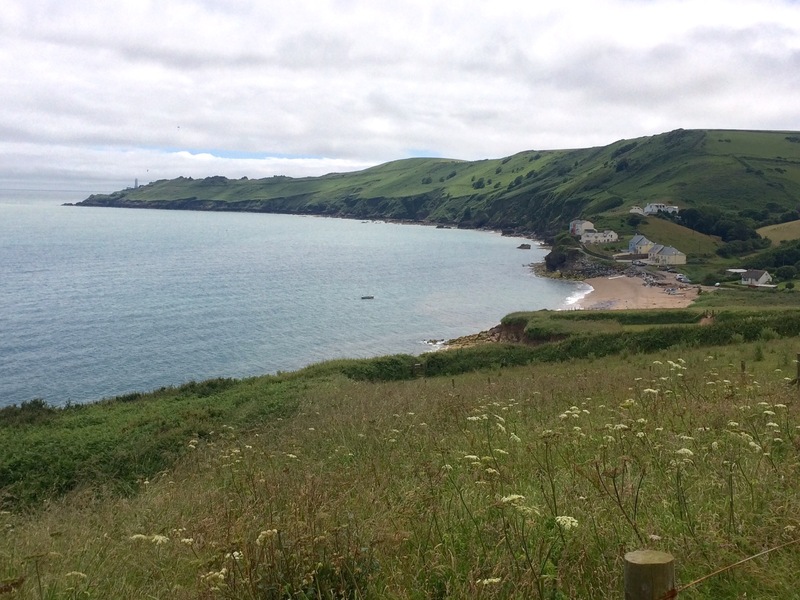 I was hungry so decided to walk the long, steep road to the beach to get some breakfast when the cafe opened at 9am. I had to wait until 10am for the ferry across the River Avon anyway. This one passed without incident. 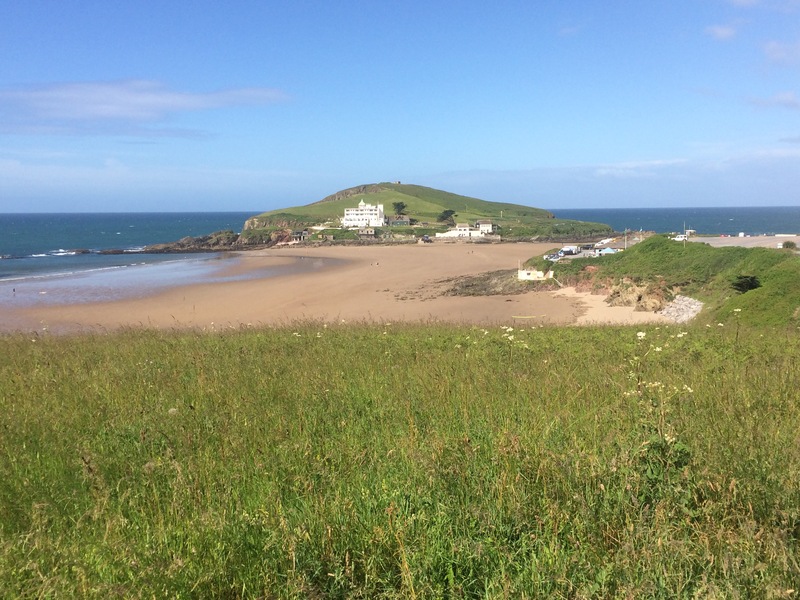 There were lots of cars arriving at Bantham Beach as the Outdoor Swimming Society were hosting a swim down the river to the sea. 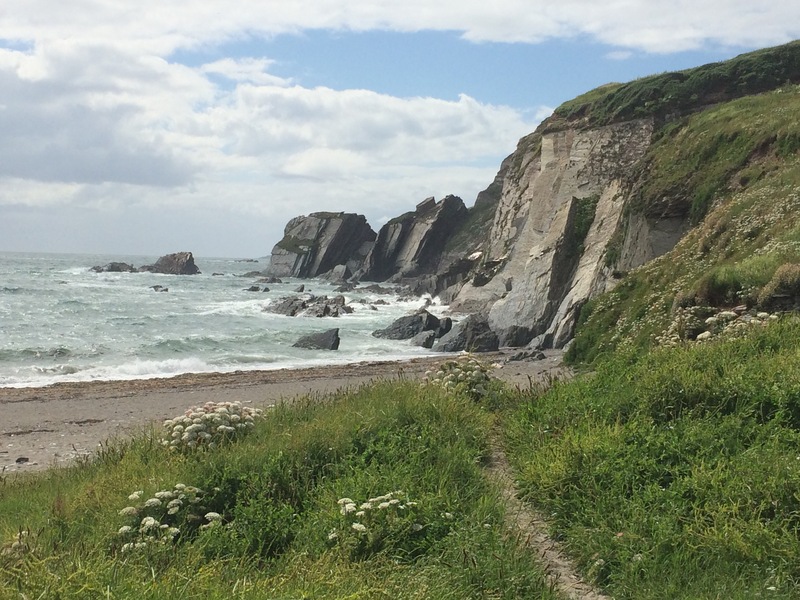 The beach looked nice but I carried on over the cliffs and around to Thurlestone Beach. I stopped to watch a kestrel hovering just beside me and got a great view of him diving to catch a small mammal and then eating his prey on the cliff. The beaches here were nice, although I noticed there were lots of menacing-looking rocks underwater that restricted entering the water. It was really windy again and there were plenty of kite surfers taking advantage. 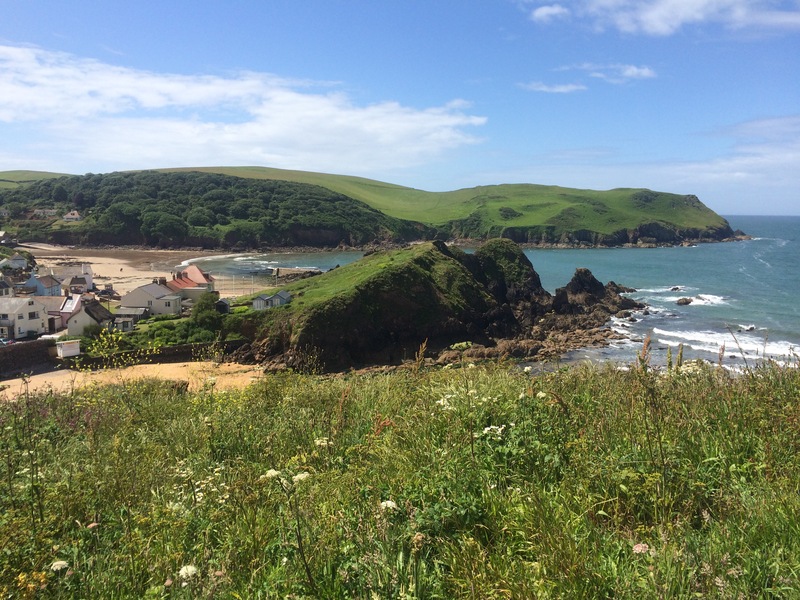 I passed through Outer- and Inner- Hope, skirting behind their shared beach, Hope Cove. Both had some lovely cottages. 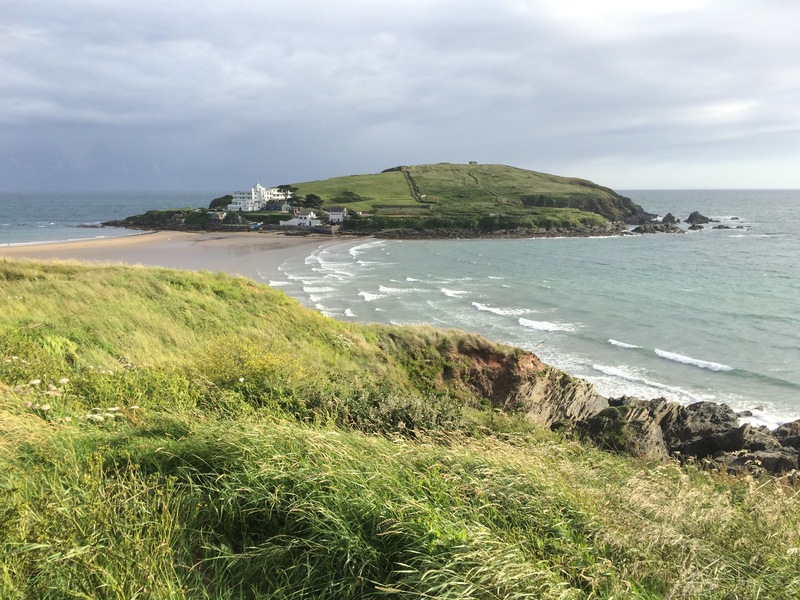 Bolt Tail signified the end of Bigbury Bay, and claimed to offer views back to Dodman Point on a clear day. 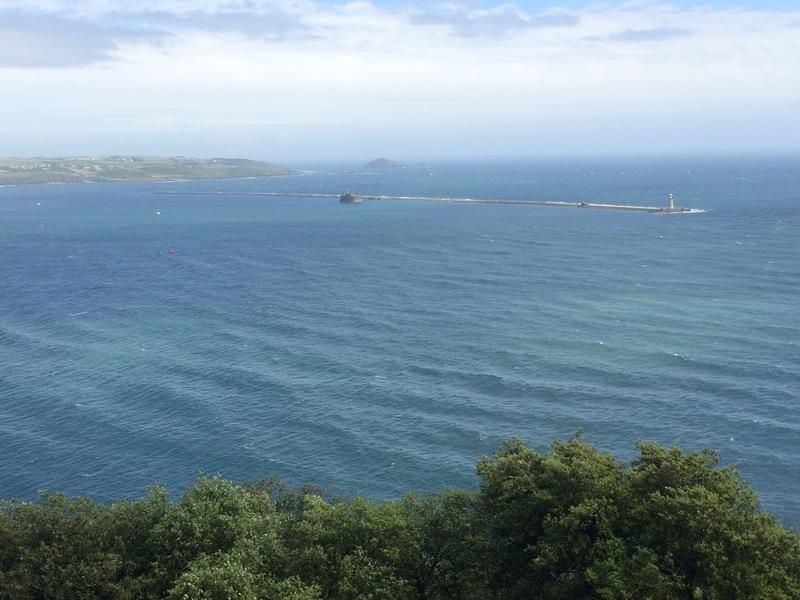 I could see a huge black cloud over Rame Head and it was coming my way. 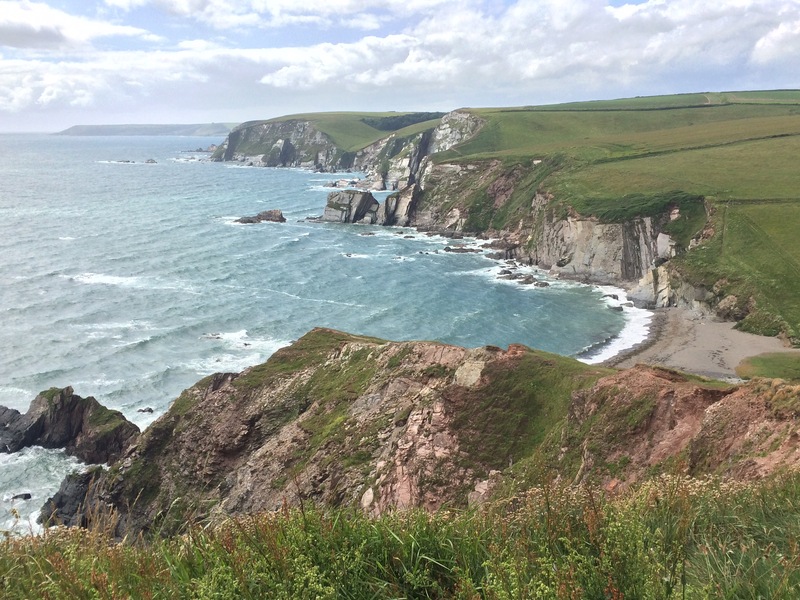 The cliffs between Bolt Tail and Bolt Head were very rugged, reminding me of North Cornwall and also a bit of the Quairing on Skye. 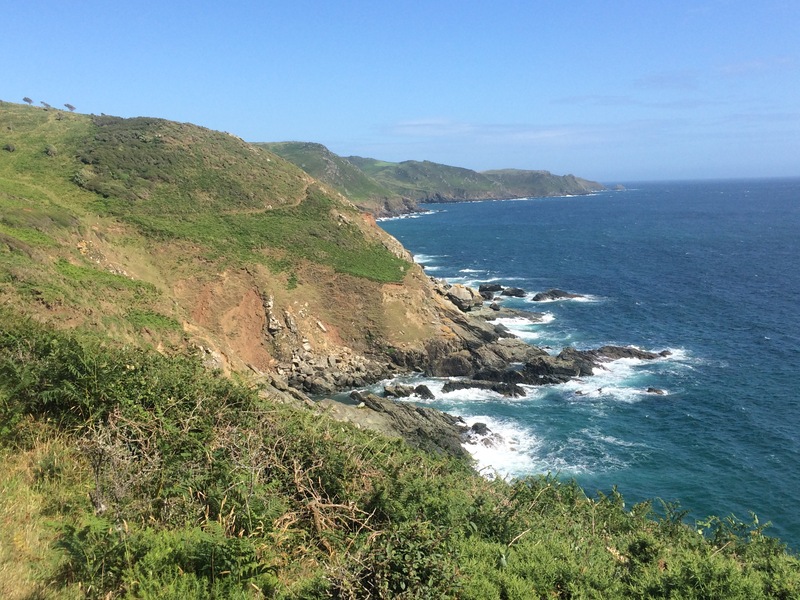 The views inland were almost as good as the views of the sea. 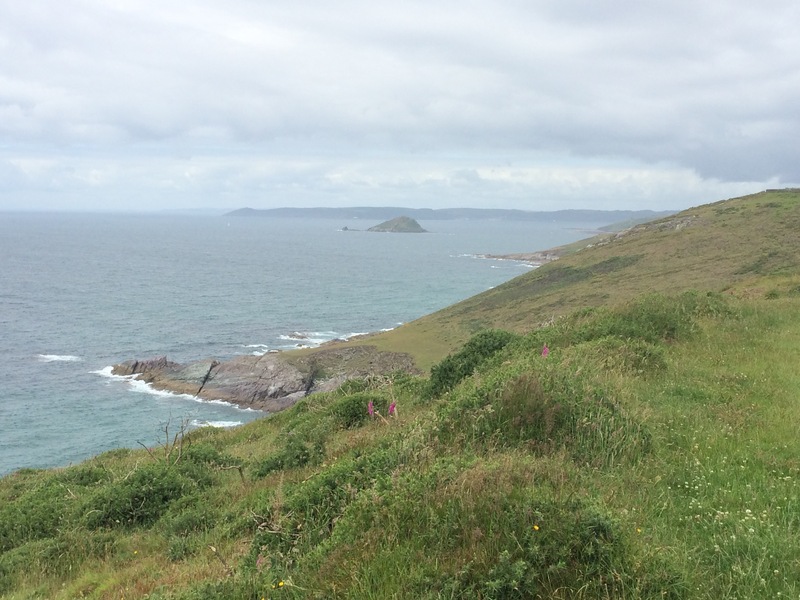 The monsoon-like rain caught me just before I reached Bolt Head. 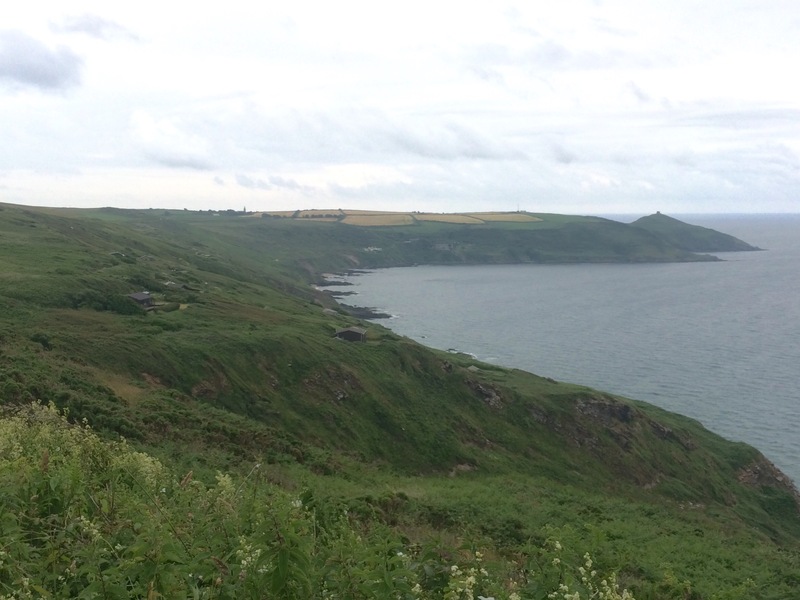 It was horizontal thanks to the strong wind so I was soaked to the skin at the back and dry-ish at the front. 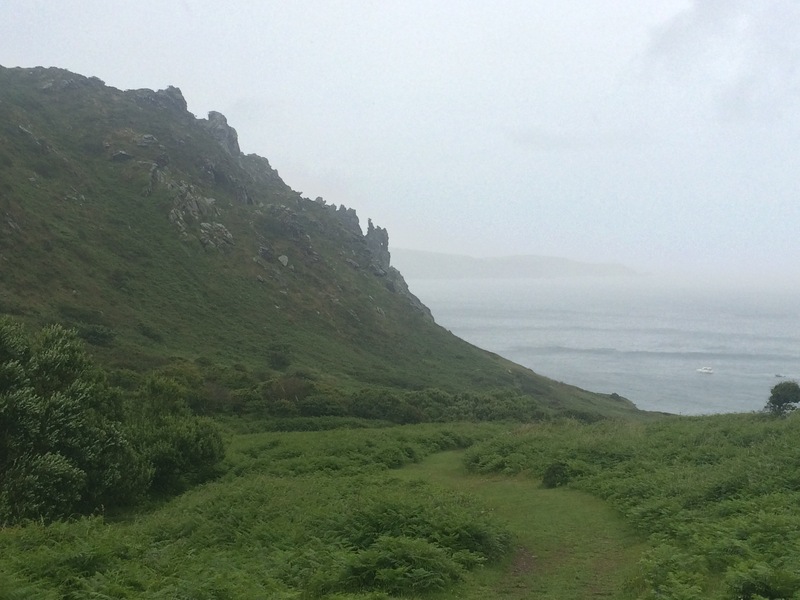 I didn’t walk all the way out to Bolt Head but cut off the end and clambered around Sharp Tor just as the rain eased. 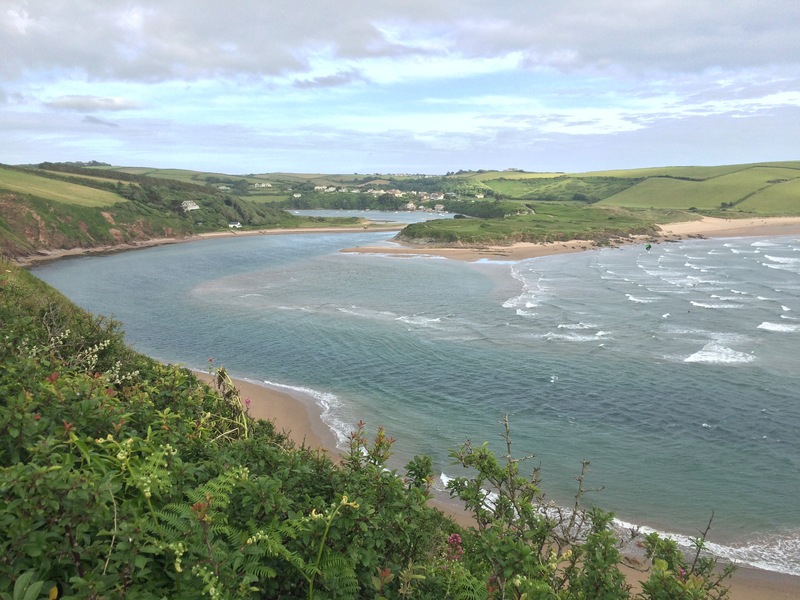 I could see up the entrance to the Kingsbridge Estuary to Salcombe. 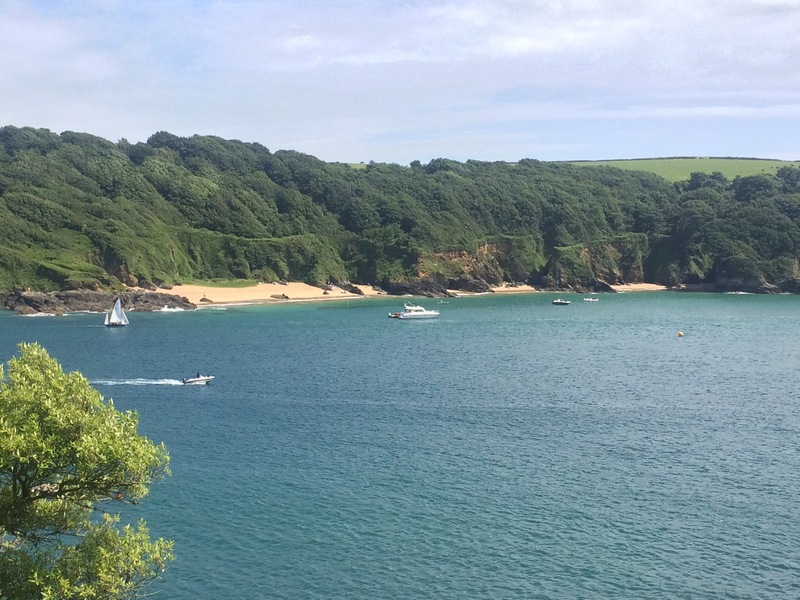 I think there were more boats around Salcombe than I saw in either Falmouth or Plymouth. They were crammed in. 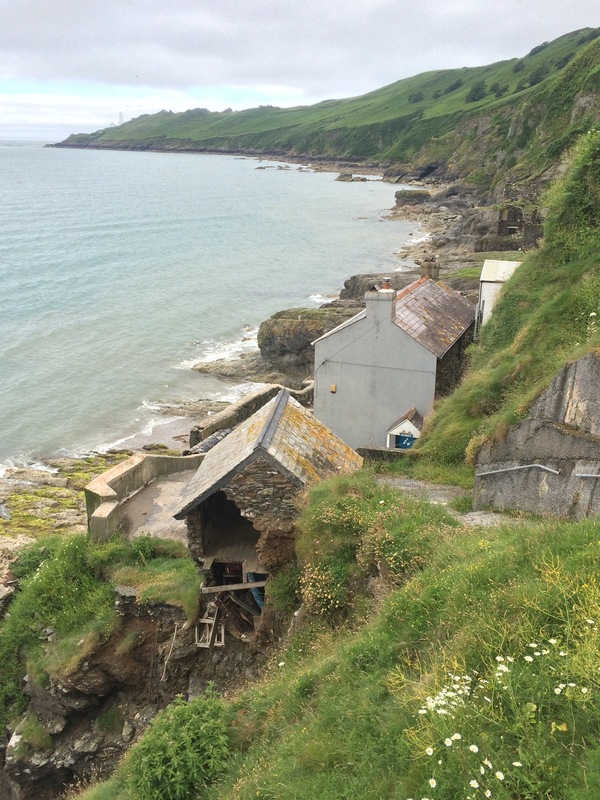 This place had serious money as there were enormous houses dotted all over the cliffs. 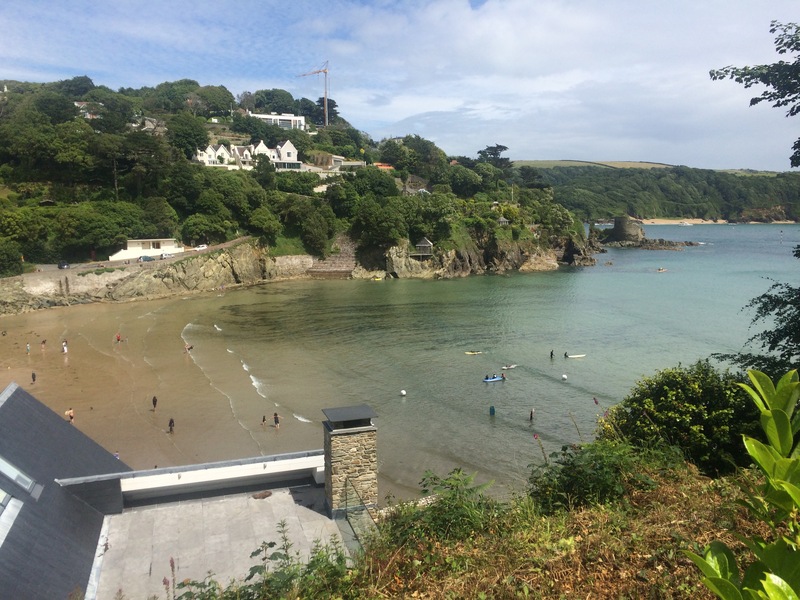 There were several little beaches, on both sides of the estuary. The water looked a lovely bottle-green, and with the palm trees that were dotted around (and the glorious sunshine that was now overhead) I felt like I might be in the Caribbean. 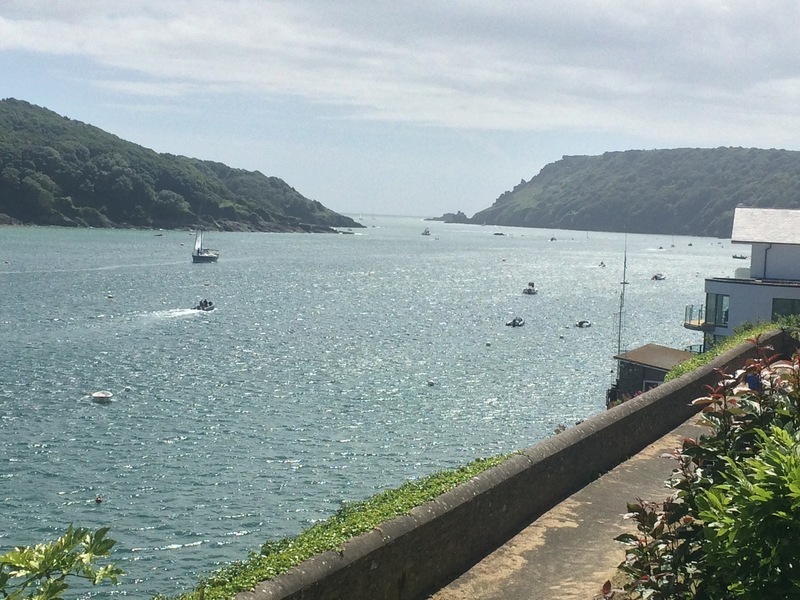 Salcombe is not designed for walking; narrow lanes spell disaster, particularly when filled with rich youths in big cars driving too fast. 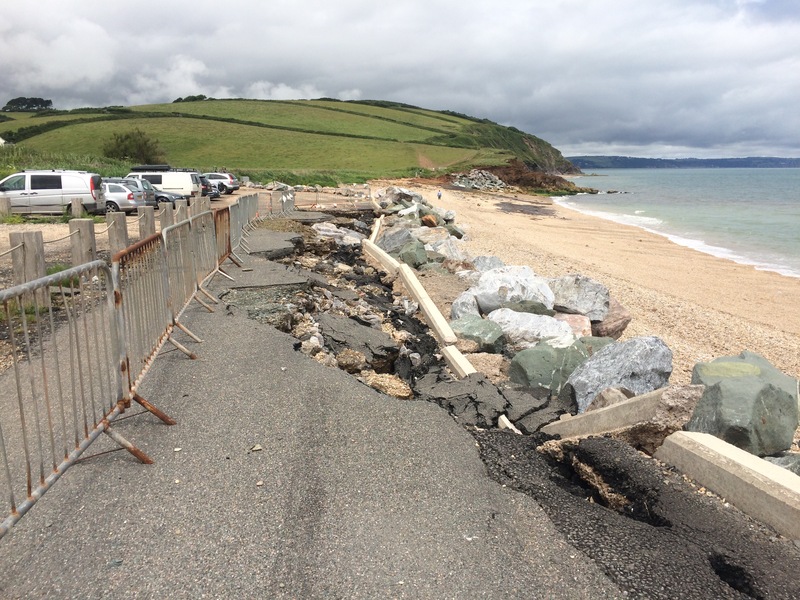 I had one lucky escape and thought I should have got the ferry from South Sands to the town centre. The town centre was packed. I managed to buy a lovely sandwich from a deli and sit on the waterfront watching people heading to and from boats. I avoided all the posh shops. 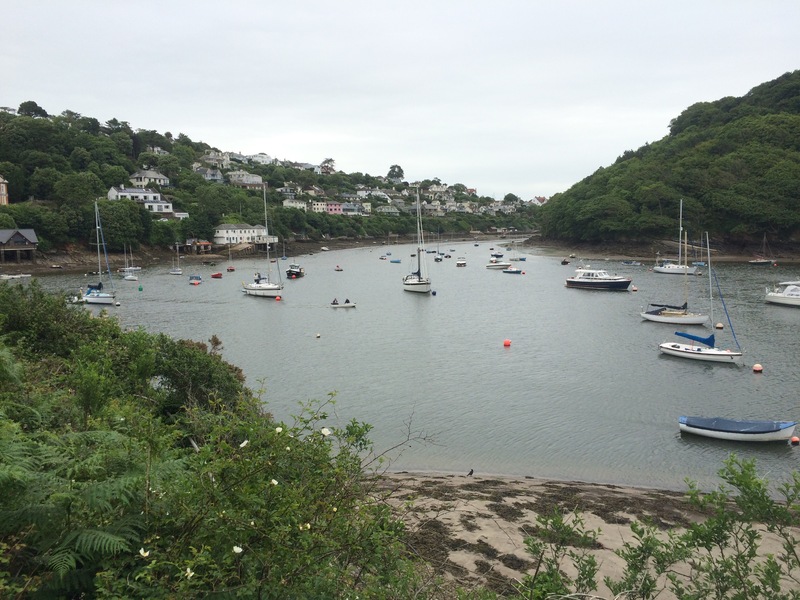 After an hour’s break I caught the ferry across the estuary and walked past all the posh houses tucked around Mill Bay. 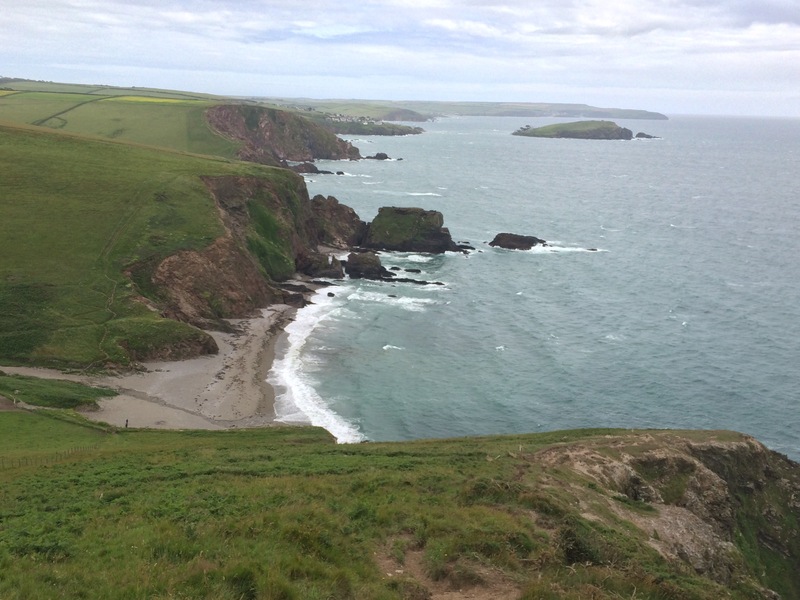 The walk to Prawle Point was wonderful. 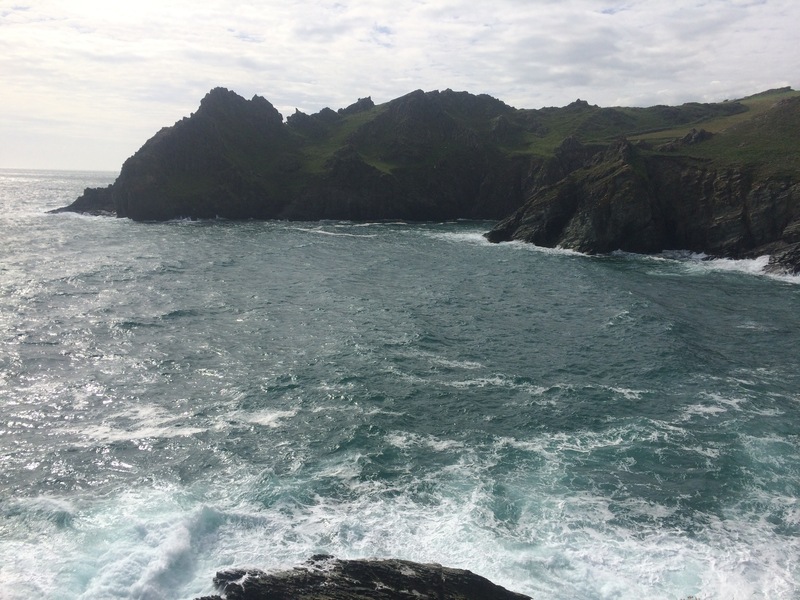 The terrain was rugged and the sea was pounding the cliffs in a white froth, making the sea look minty fresh. Yet more up and down; very tiring at the end of a long walk. 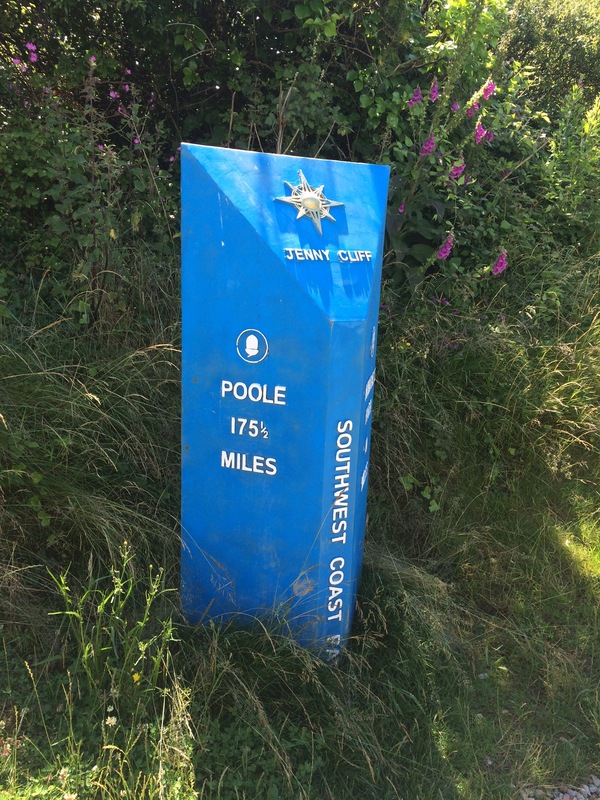 I had reached the Southernmost point in Devon. 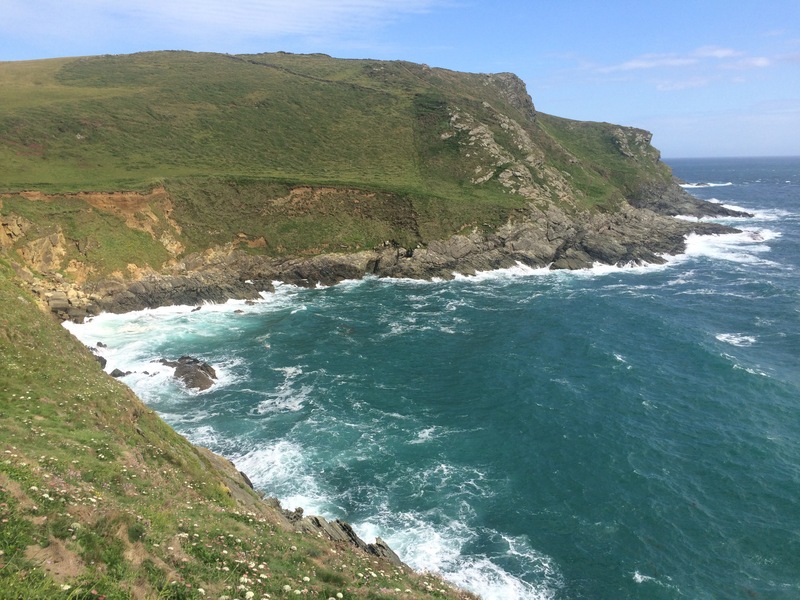 steep cliffs, no room for error! 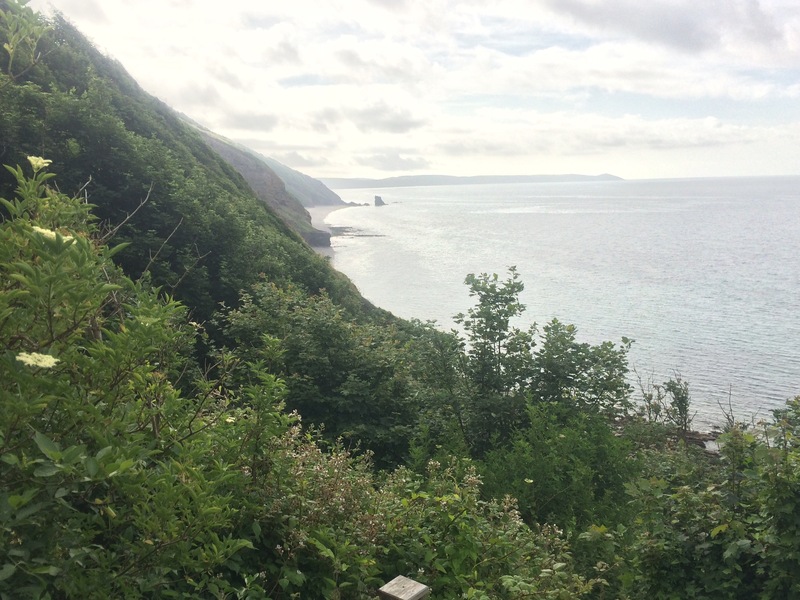 I popped into the Lookout Station at Prawle Point and discovered an old man had just fallen off the cliff ahead of me. Fortunately he was only walking wounded. The coastguard has been very busy until 2 minutes before I arrived. 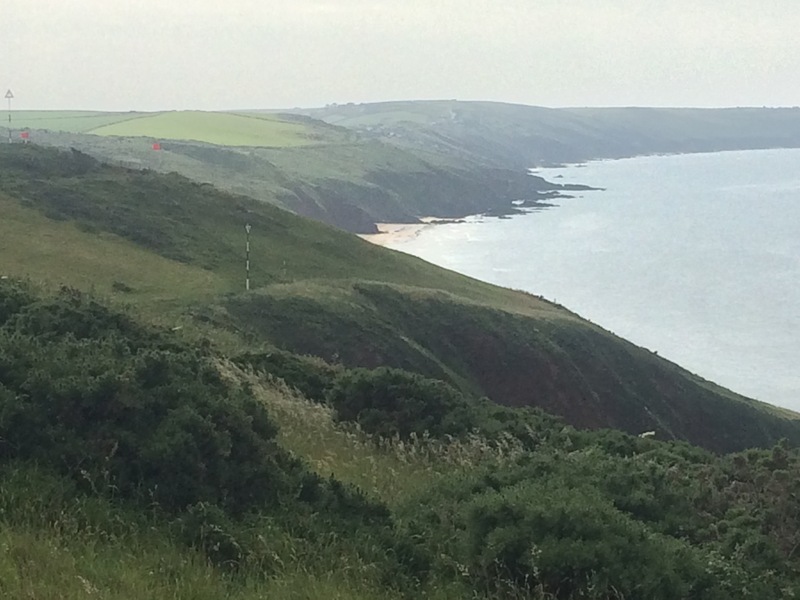 I walked up the hill to East Prawle (all the campsites seem to be at the top of a hill). There were 2 campsites and I chose the better one. 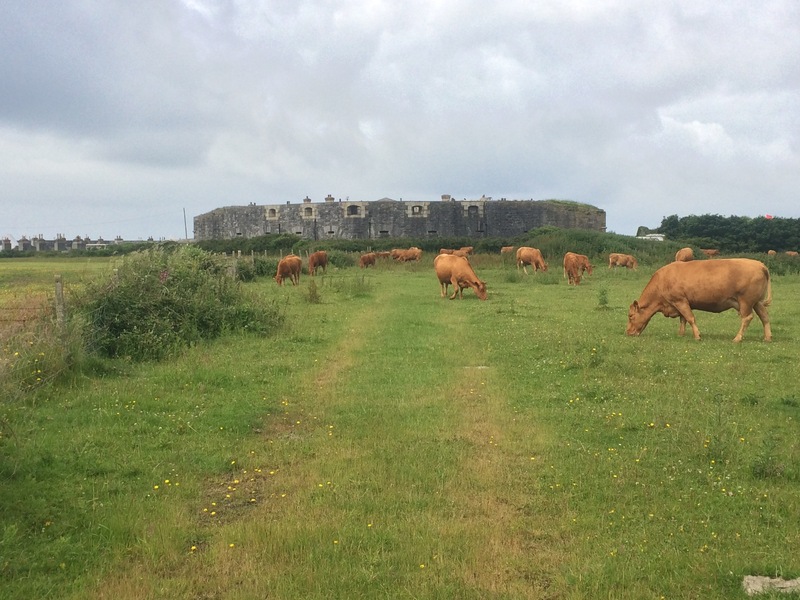 This one was a cow field; the cows had been removed but it was full of cow pats. The grass was knee high and there was a toilet block that I didn’t find (it was a dirty old shed and you needed to provide your own loo roll). I didn’t find a water tap either (I stole into a caravan site and used theirs). And this was the better site! I spent a while picking grass and covering the fresher cow pats so at least I wouldn’t be rolling in one overnight. Then I headed to the pub, The Pig’s Nose Inn, for a shower. They have a shower room in the cellar with 4 shower heads in it. Very weird, but I was desperate. The Pig’s Nose had been recommended to me as a quirky pub and it was definitely that. It was owned by an ex-roadie who still gets his mates to play in the hall next door. They were playing tonight and the pub was full. I managed to walk in without paying for a ticket, which was fortunate because I left after one song. I returned to the bar and the raucous music that was being played. 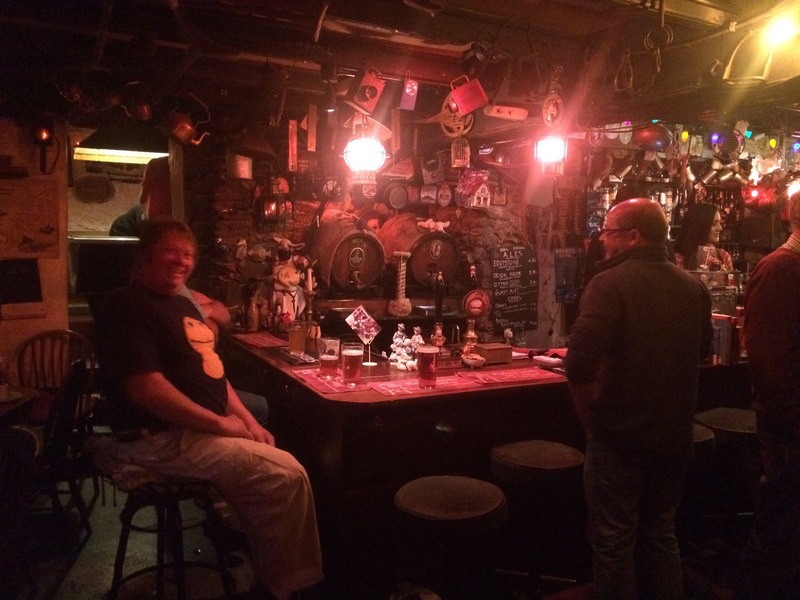 I was being led astray by Mark, Mark and Churchie, who were camping for the weekend to come to this pub. I didn’t leave until well after midnight. It was a cloudy non-descript kind of day and very windy. It hadn’t been windy like this for a good couple of months. 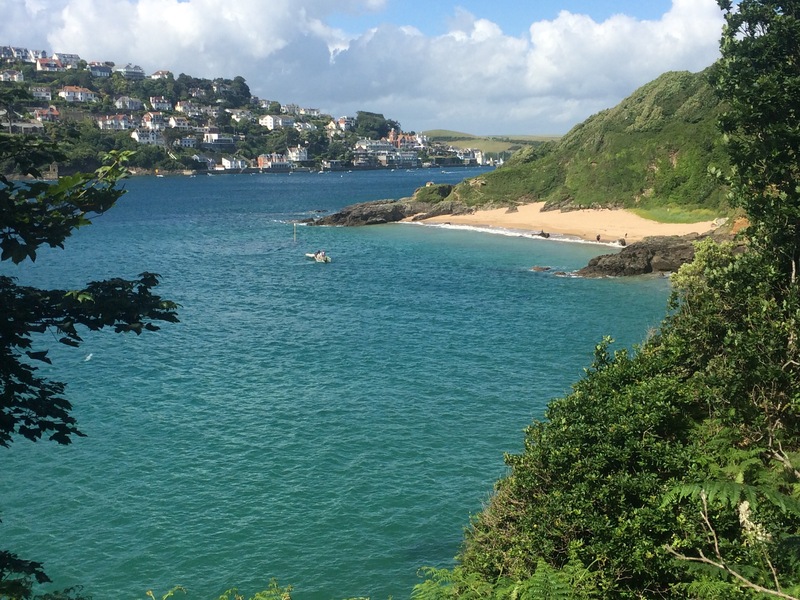 I packed away, ate the snacks I’d bought from the Spar shop yesterday, and headed for the ferry across the River Yealm. The ferry doesn’t run until 10am and I was there in plenty of time to be the first customer. 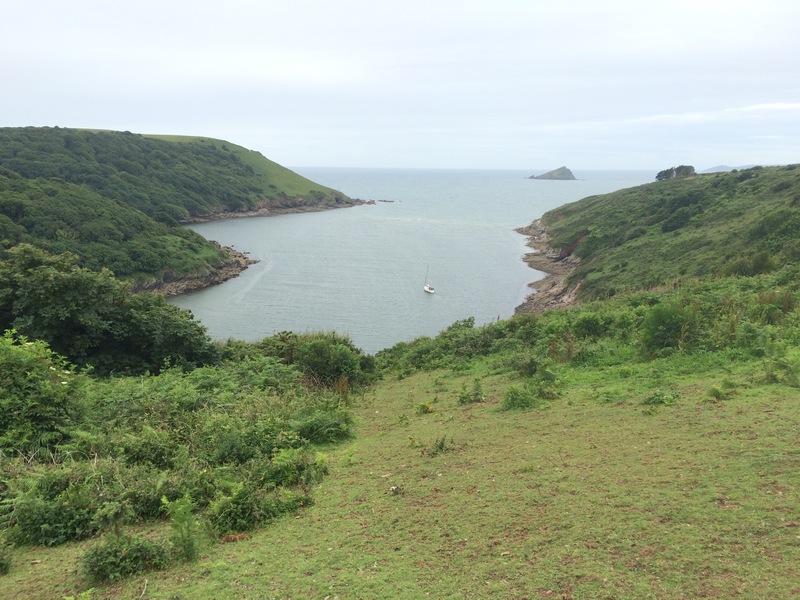 The ferry is located at a kind of 3-way junction on the River Yealm and runs between Warren Point (the Wembury side), Newton Ferrers and Noss Mayo. 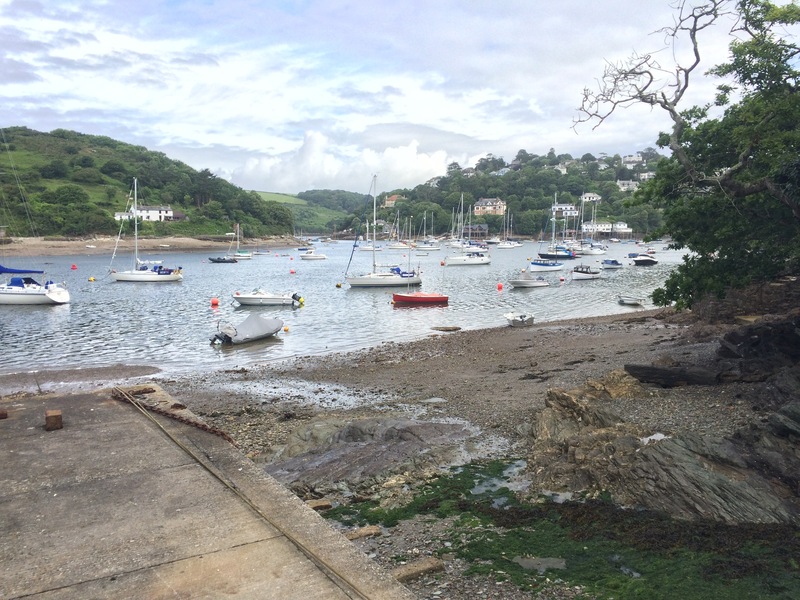 The Yealm Estuary is a drowned valley (Ria) and its high sides provide a sheltered harbour. There were lots of yachts moored up. This is also oyster country as they have been farmed here since at least Norman times. 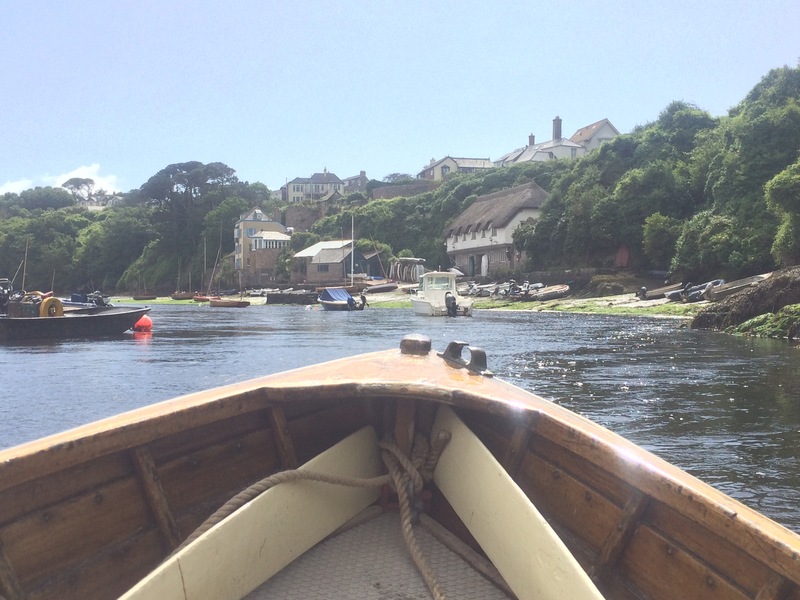 He found some customers wanting a lift from their boat to the shore so he managed to extract some change from them (after I’d warned them they needed to have some change) and obviously we had to drop them off first before he would take me to Noss Mayo. What a cheek. I was fuming at his attitude. There was no way I was giving this joker any extra money. The walk to Revelstoke Park was mostly along a track and easy going. 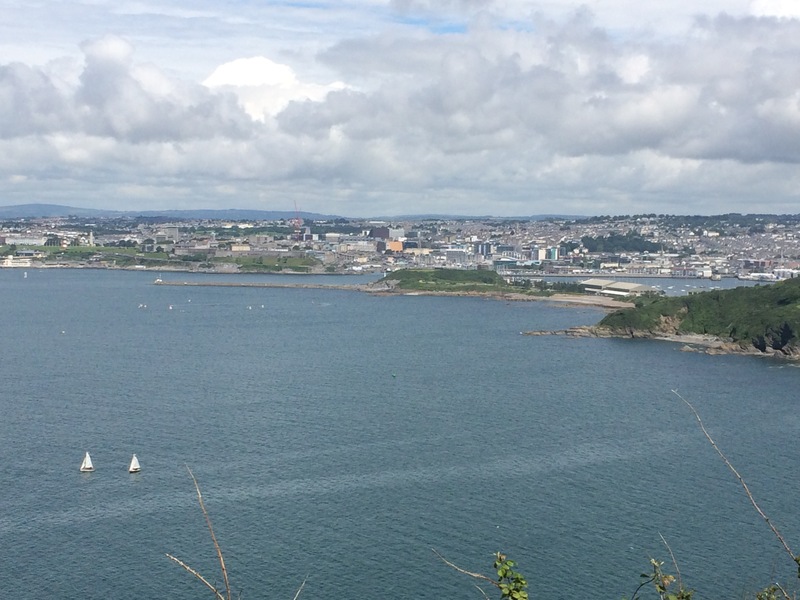 I had views back across Plymouth Sound before I rounded Stoke Point and headed into trees. 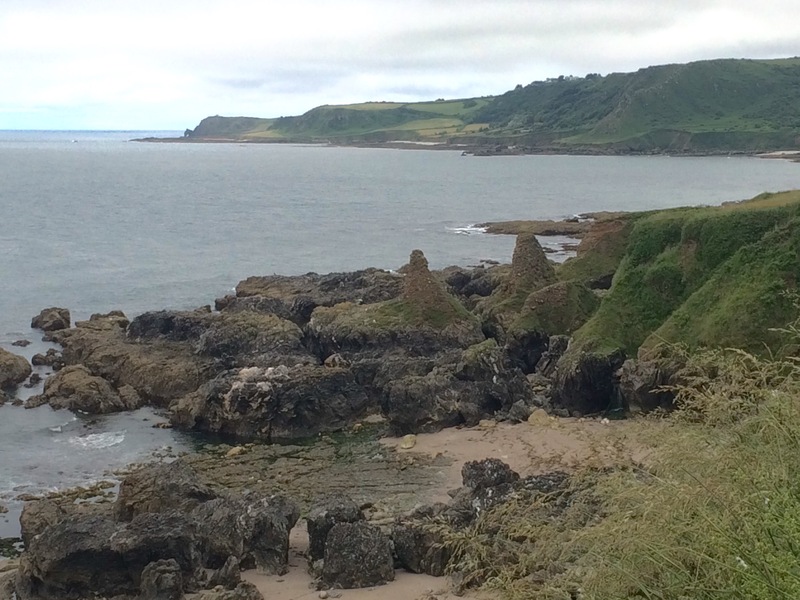 Hidden near the shoreline was the 13th Century Church of St Peter the Poor Fisherman. 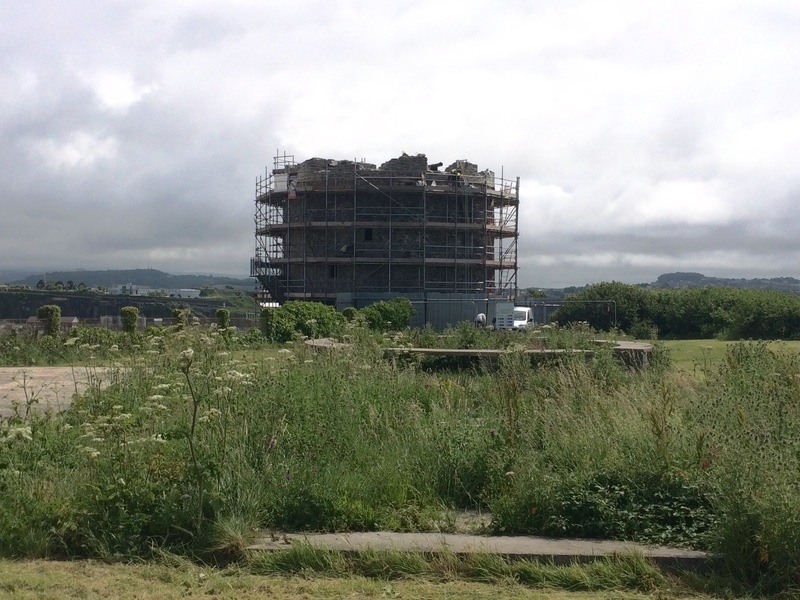 It looked intact apart from not having a roof, although this seemed to be part of the design. 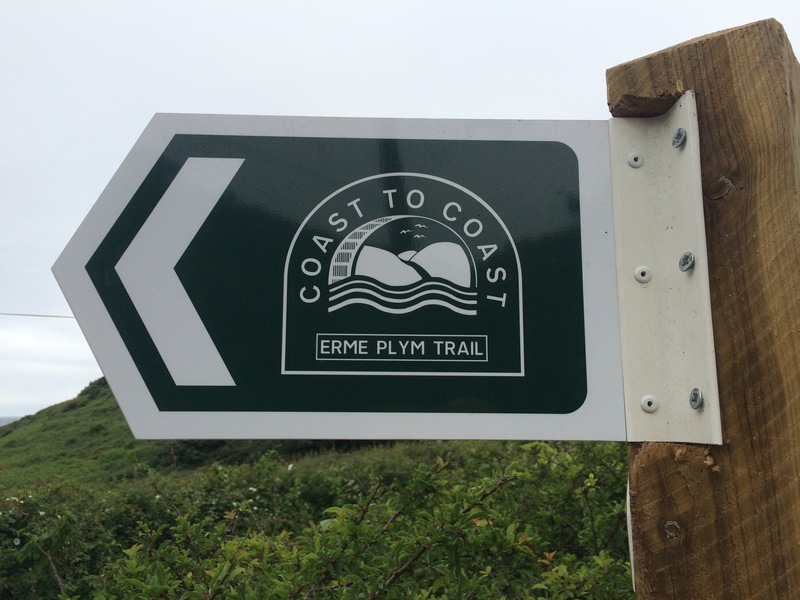 There were a couple of very steep hills on the way to the River Erme, and a few coves. 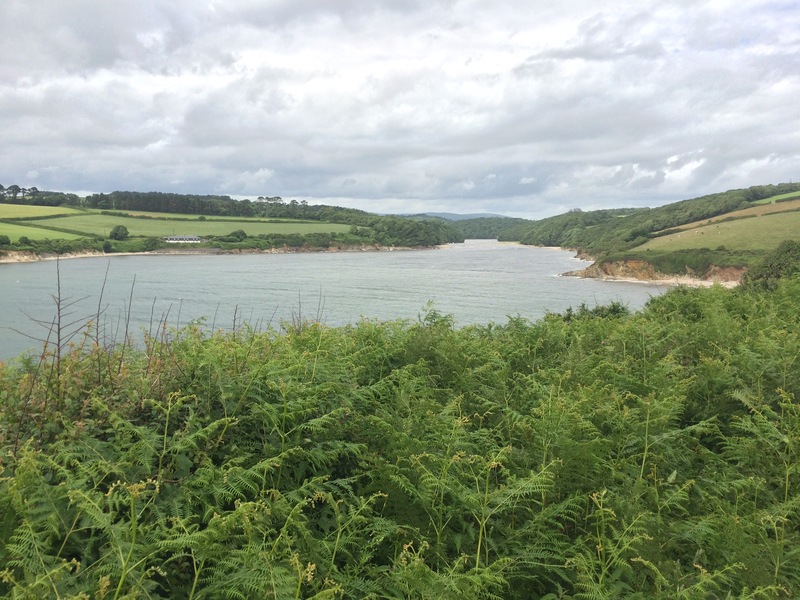 The River Erme does not have a ferry and can only be crossed an hour either side of low tide, by wading. 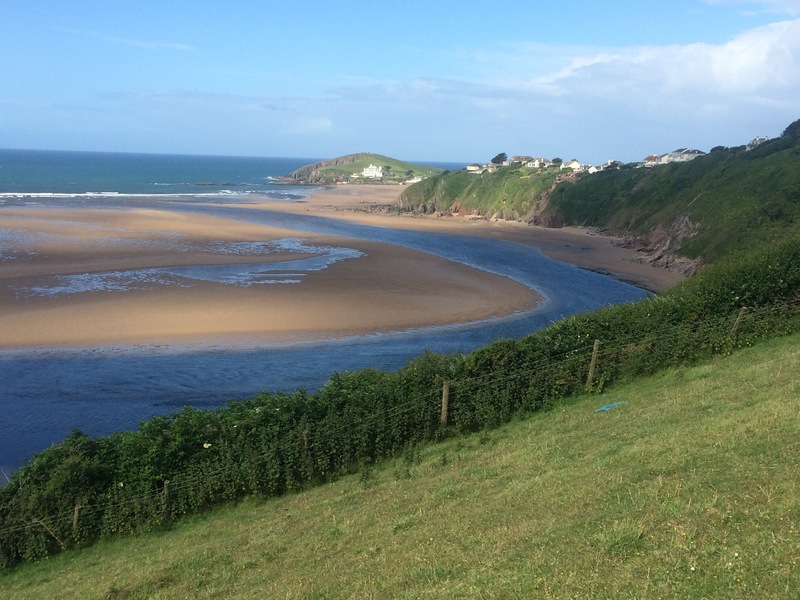 I arrived at mid-tide and there was no way I could cross. All the signs said I had to get a taxi (there are no buses and to walk around would require an extra 9 miles all along busy minor roads). 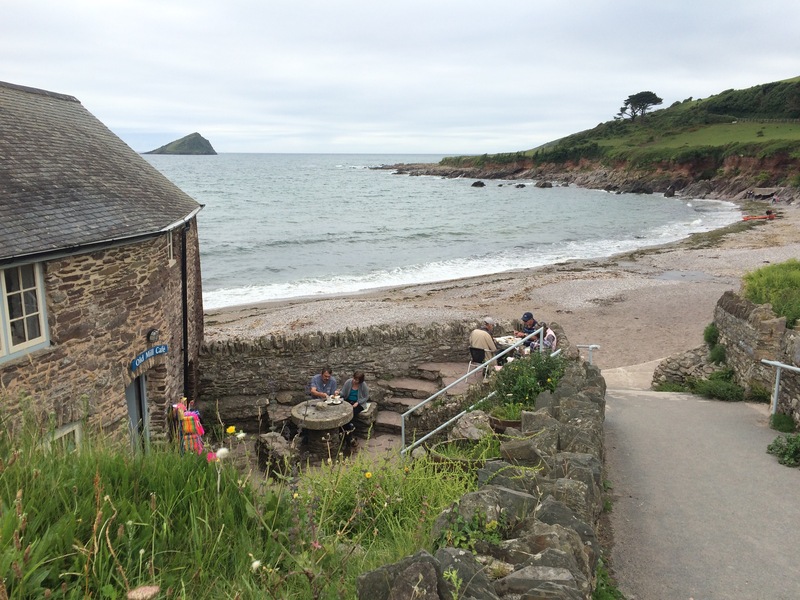 I walked up the hill to Mothecombe Old Schoolhouse cafe and had a cup of tea while I waited for a taxi. The taxi cost £30 and took half an hour to drive all the way around. This river needs a ferry! The taxi driver was very nice and was disgusted by the behaviour of the ferryman. There was no love lost there! 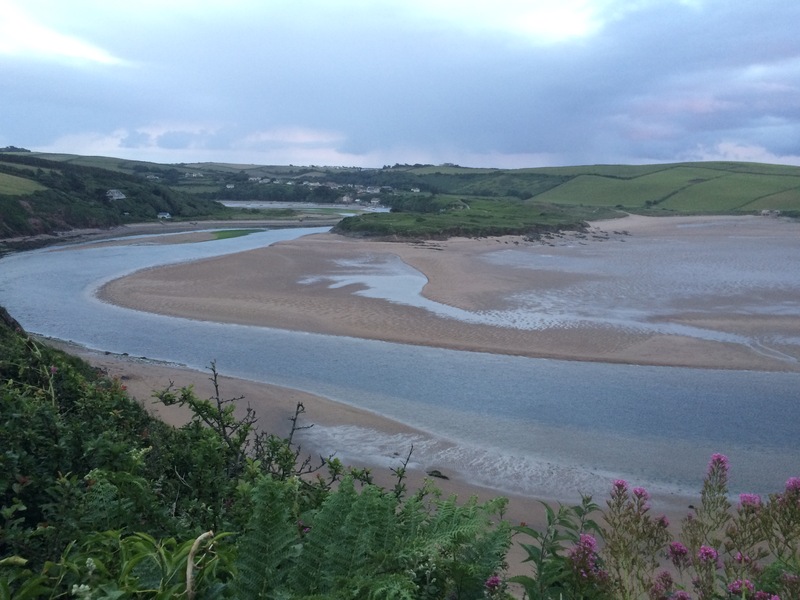 the Erme Estuary at mid-tide; definitely not wade-able! 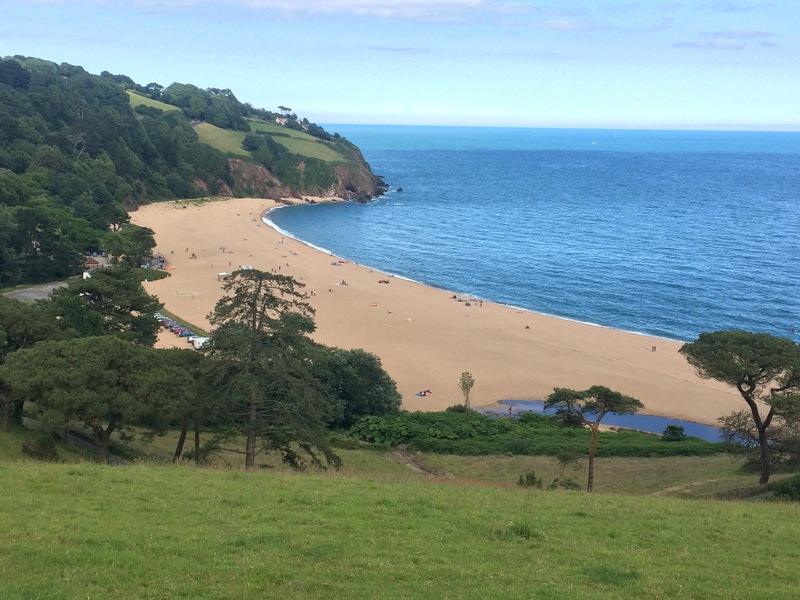 I was dropped off at Wonwell Beach and watched a man swim across the river to Mothecombe Beach, where I’d been an hour earlier. The next section had several very steep ups and downs. The Rock was different here, it looked like great slabs of sharp slate. The beaches were grey and in inviting in the gale that was blowing (although it wasn’t cold). 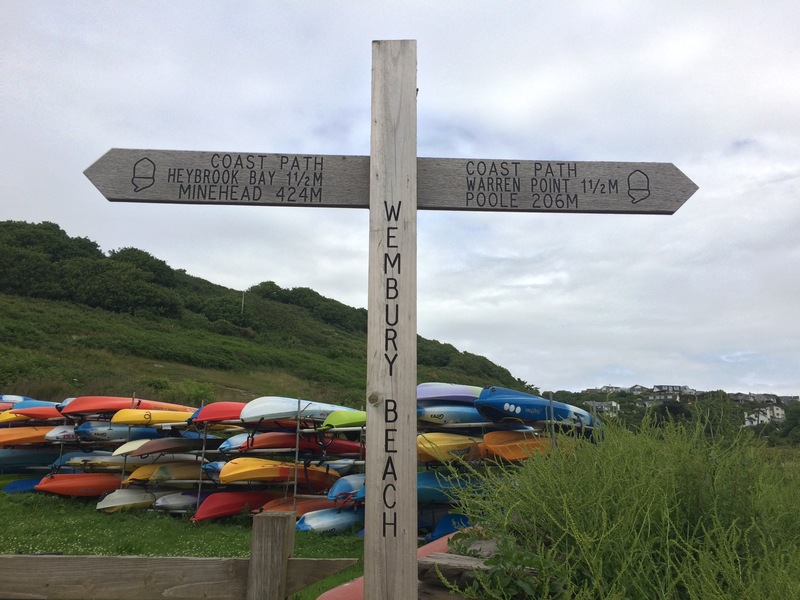 Eventually I arrived at Challaborough, an enormous static caravan park right next to Bigbury-on-Sea. 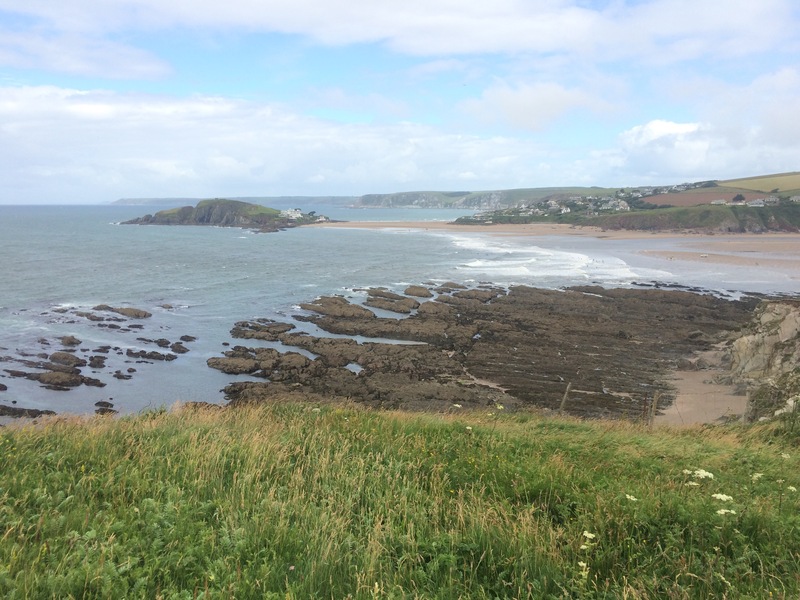 The tide was in and so Burgh Island was cut off. 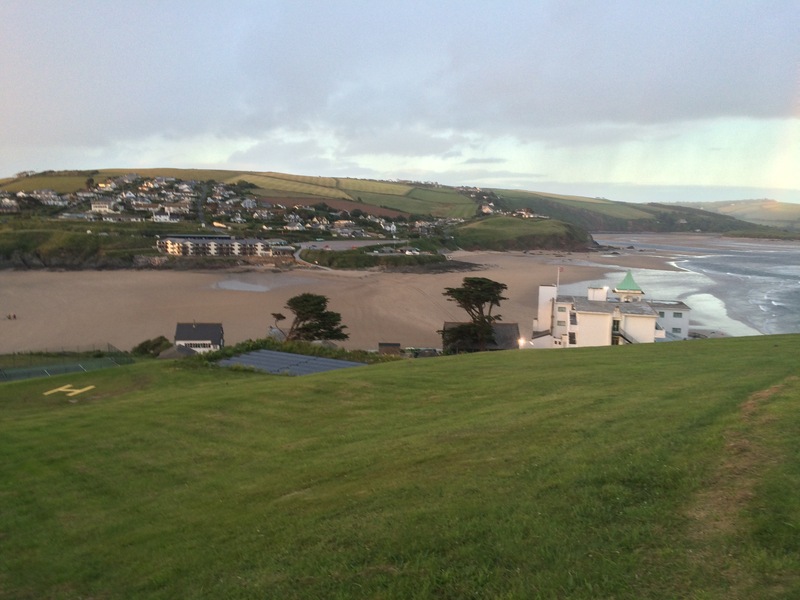 I could see the ruined chapel on top, the Pilchard Inn and the large, Art Deco hotel. 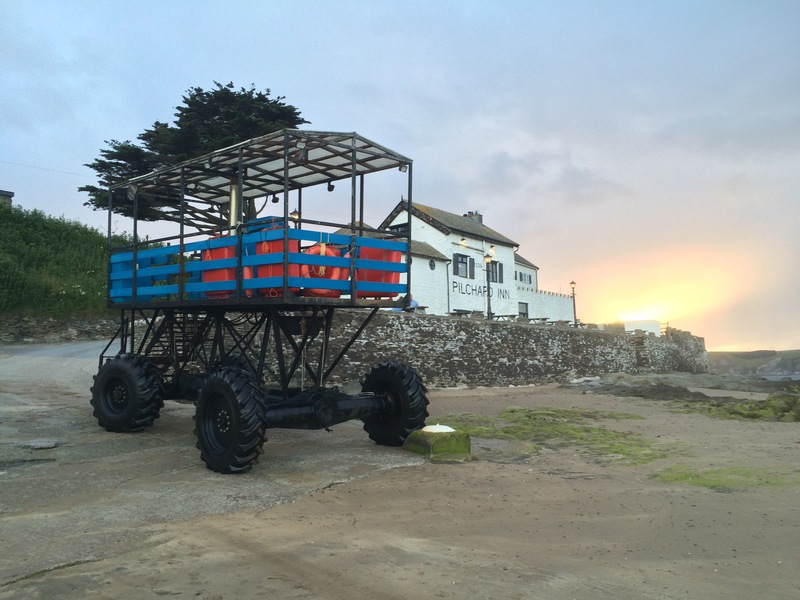 I watched the sea-tractor (a sort of 4×4 vehicle on stilts) ferry some people across to the mainland. It was a long slog uphill to my campsite. 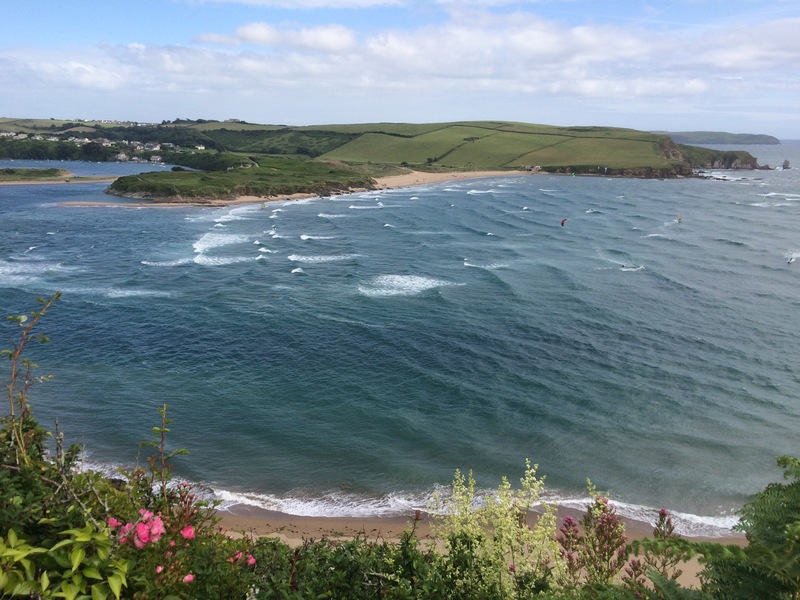 The wind was very strong and there were lots of kite- and wind- surfers out in the Avon Estuary. There wasn’t much shelter on the campsite so I pitched my tent in trepidation of a sleepless (and possibly a tentless one). 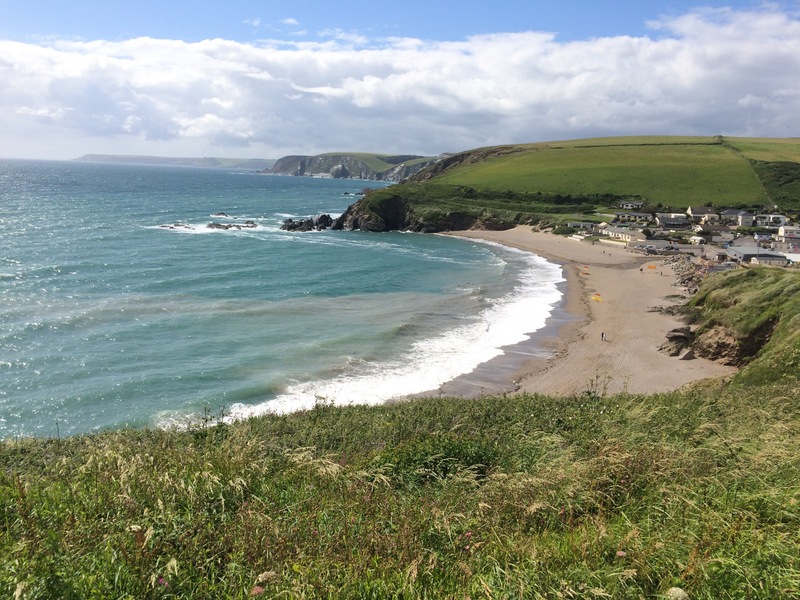 The view was nice, right across Bigbury Bay, but the campsite facilities were not the best. 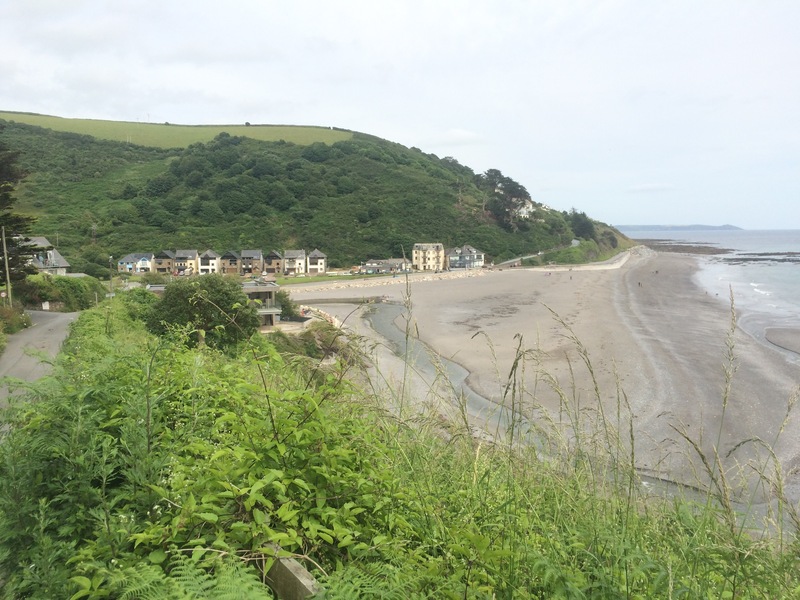 It was a long walk downhill, and then back uphill, to the holiday park clubhouse at Challaborough. This was the only food within a reasonable distance. 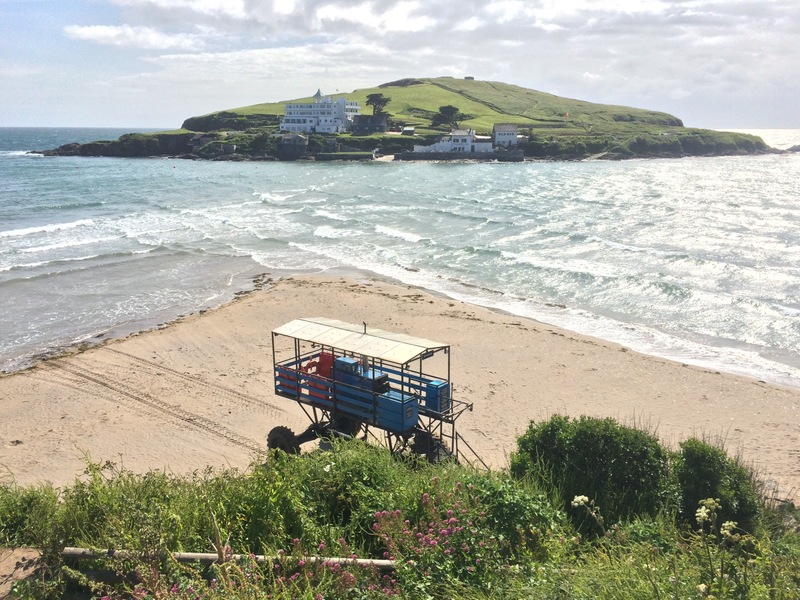 I ate quickly, charged my phone and thought I’d walk back via Burgh Island (the tide was not out). What an unfriendly place! 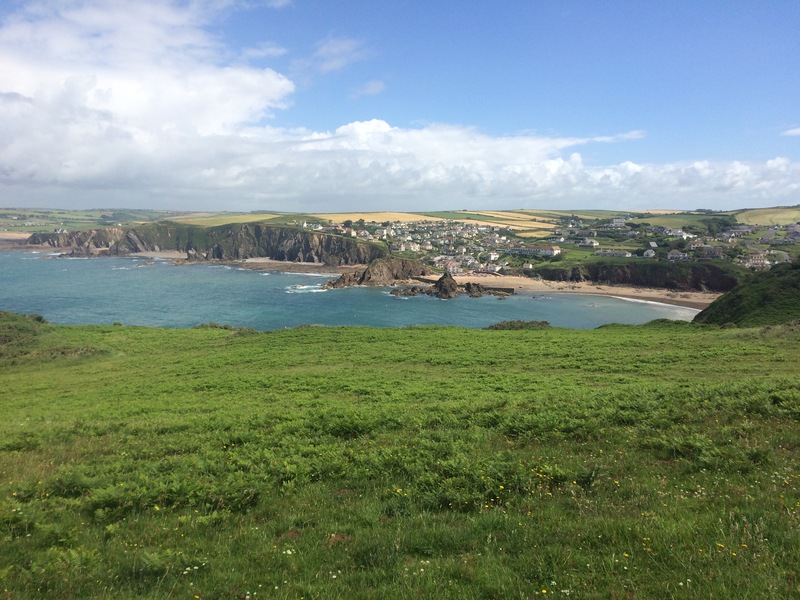 The hotel gates were shut – you need a booking, you can only walk on the footpaths and heaven forbid you should take a picnic, and the pub was only open to hotel guests. 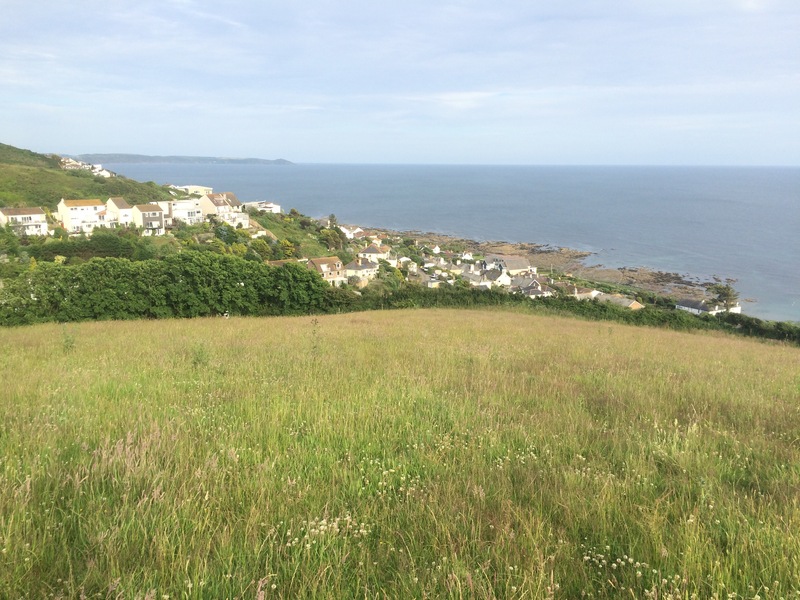 I walked to the top of the hill, by the ruined chapel, for a view of the mainland as the sun set and then left. 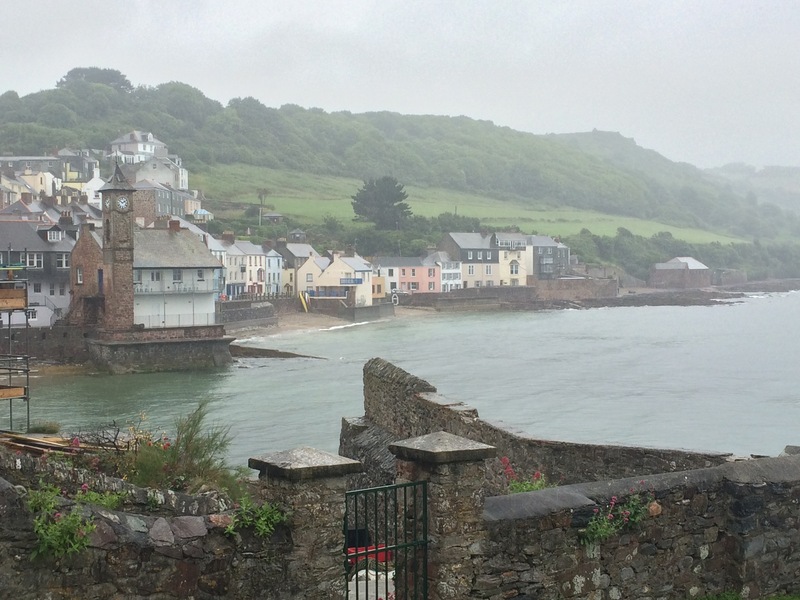 The weather was terrible when I woke up, very wet, and the rain was predicted to last all day. 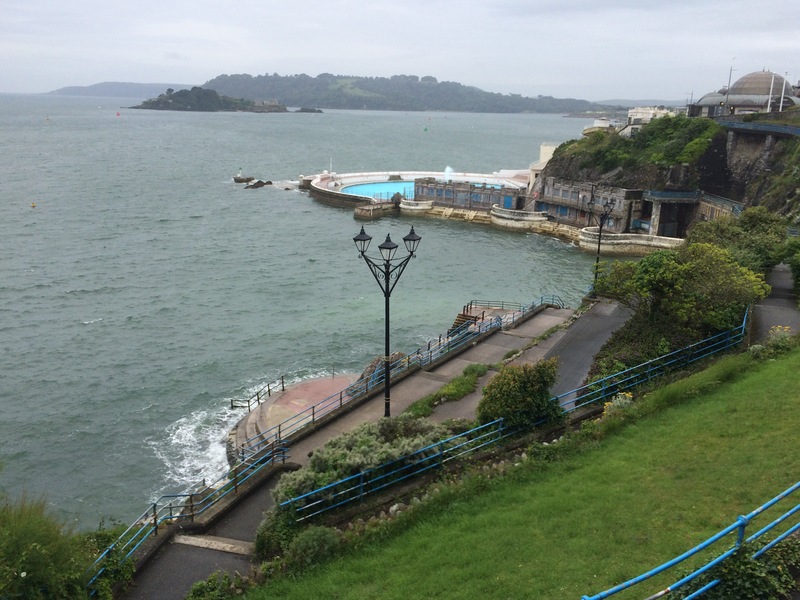 I thought this was lucky for the following 2 reasons: firstly, Kerry offered me the chance to stay a second night (which meant a proper bed) and, secondly, instead of walking past Plymouth I could take a bit of time to explore the city. Kerry dropped me off near The Barbican, the old part of the city that dates back to the 16th Century. After just a short walk across the footbridge spanning one of the wharves I was soaked. I stopped at Jacka Bakery for coffee and a truly excellent pain-au-chocolat. This bakery has been certified as the oldest commercial bakery in Great Britain, dating back to 1597, and it supplied The Mayflower with biscuits for its voyage across The Atlantic. Ancient ovens are still visible, but unfortunately unusable. 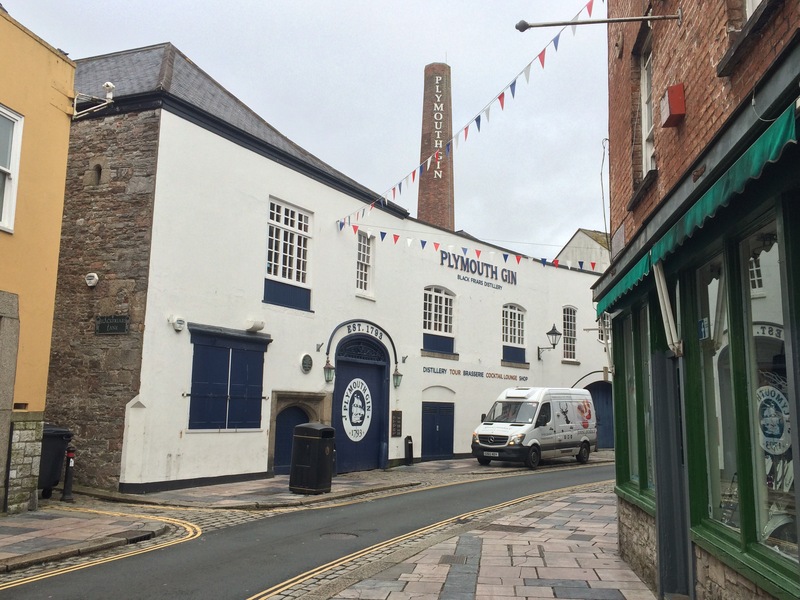 Just down the road is the Plymouth Gin Distillery, established 1793, the oldest one in England. 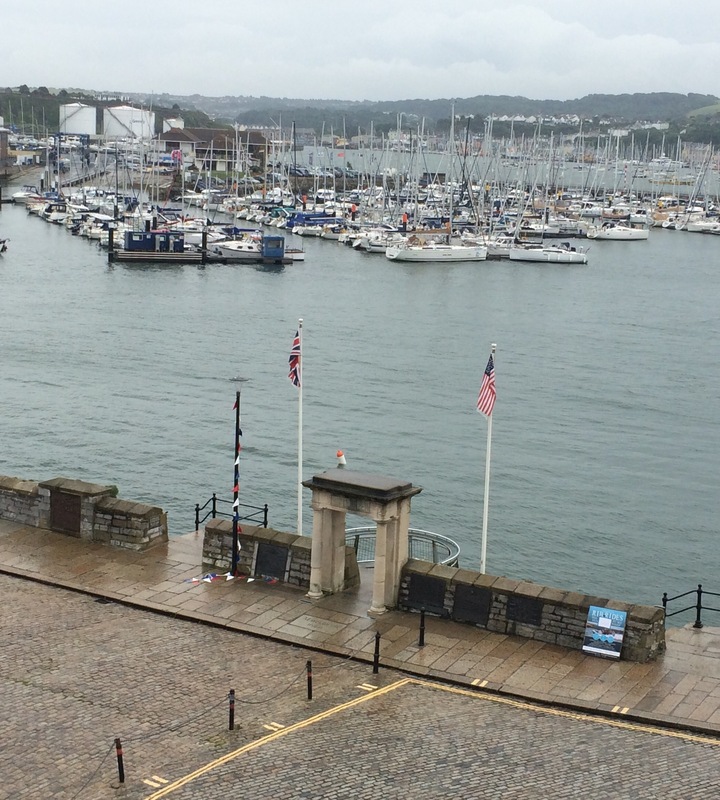 I took a tour around The Mayflower Museum, which overlooks The Mayflower Steps, the point where The Pilgrims set sail for New Plymouth. I met an American couple whose ancestor was on the ship. 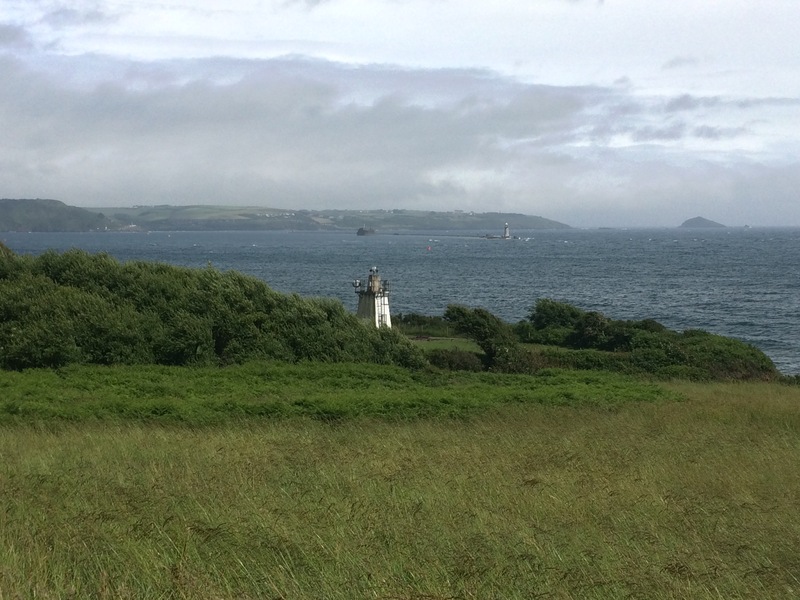 Smeaton’s Lighthouse, relocated to The Hoe 1882. Game of bowls anyone? 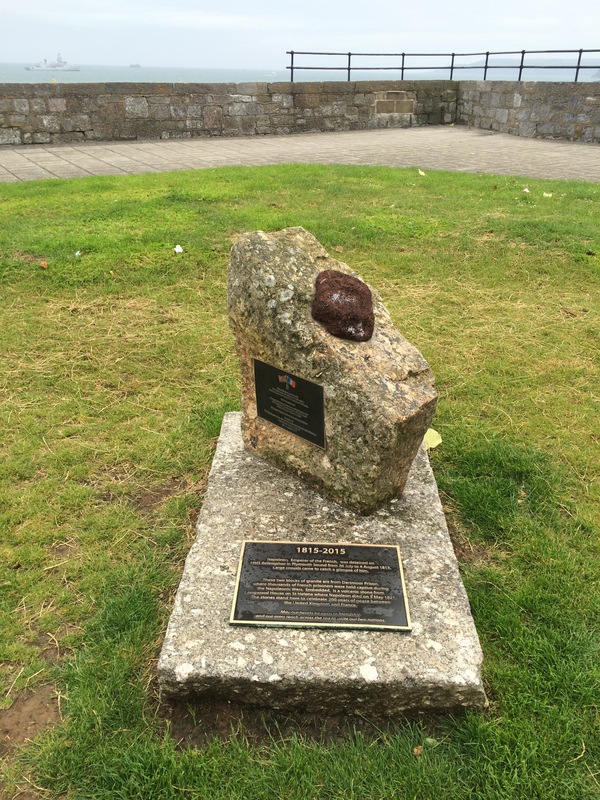 Plymouth likes its plaques and memorials. There are a lot. 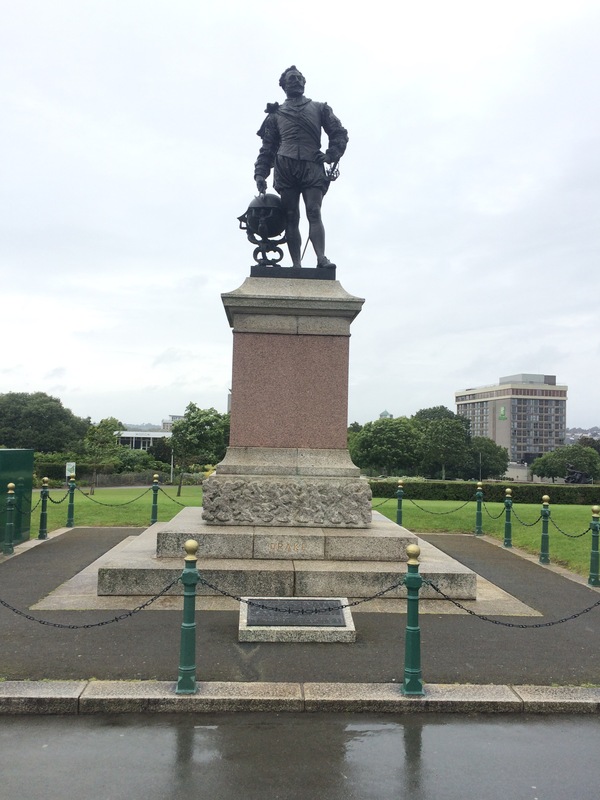 There are plaques commemorating all the famous sea journeys that started from Plymouth, and memorials commemorating the famous men that set sail from here. Most of the plaques at The Barbican Wharves were reminders of how the British colonised the New World; The Mayflower sailed for America in 1620, The Tory sailed for New Zealand in 1839 and plenty of ships sailed for Australia in the 18th Century. 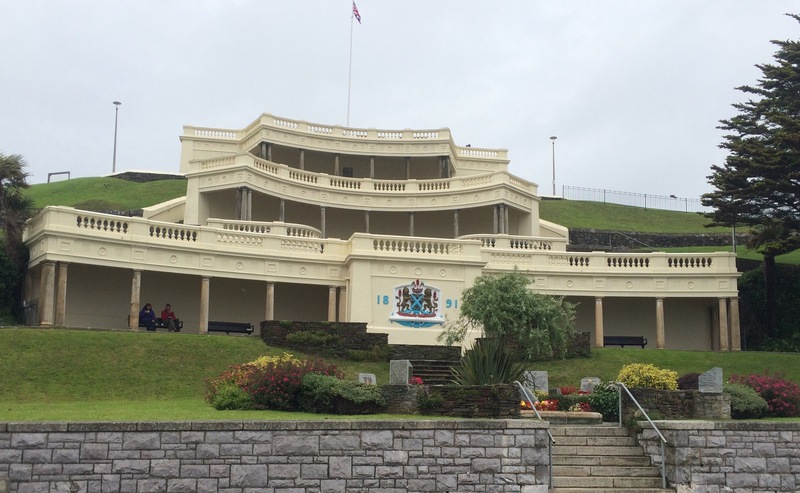 Up the hill, past The Royal Citadel, built in 1655 for King Charles II, to protect the seaward approaches to Sutton Harbour, I reached The Hoe. More memorials. 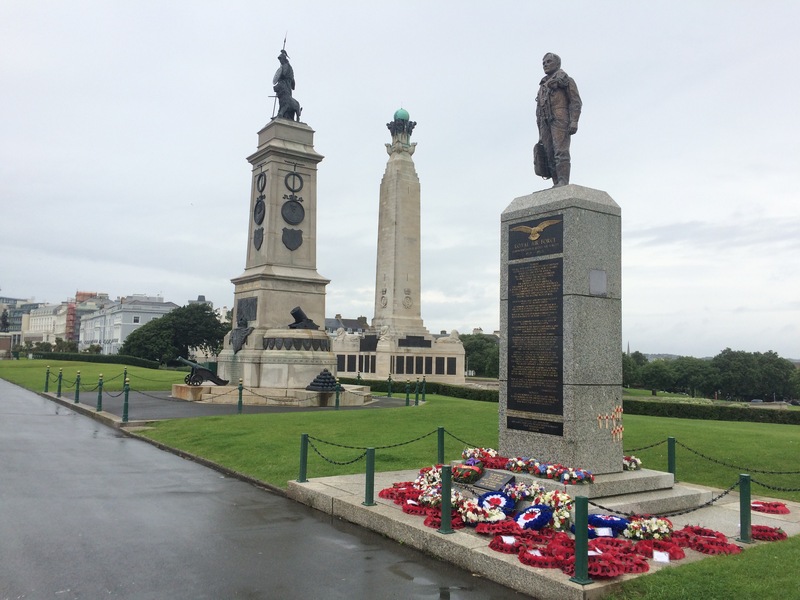 There are 23,000 names on Plymouth’s Naval War Memorial for the two World Wars, all sailors or marines based at Plymouth. 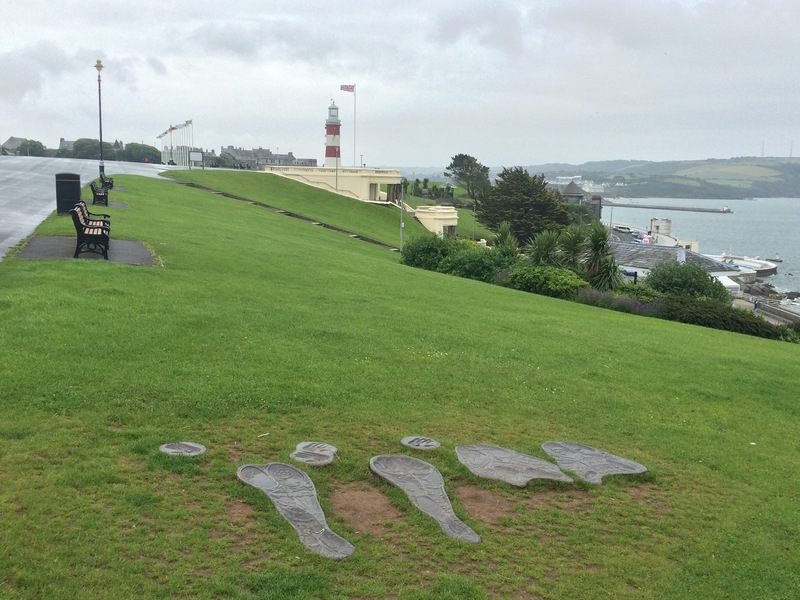 At the other end of The Hoe were 4 imprints in the grass, signifying the spots where The Beatles sat for an iconic photograph. All very strange. 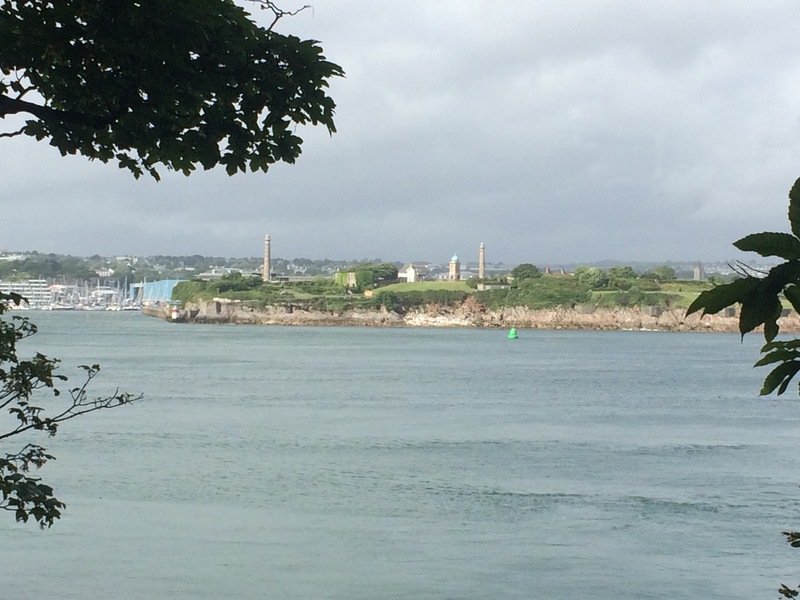 I wandered through the Stonehouse area of the city and went to the Rocksalt cafe for lunch. Highly recommended. 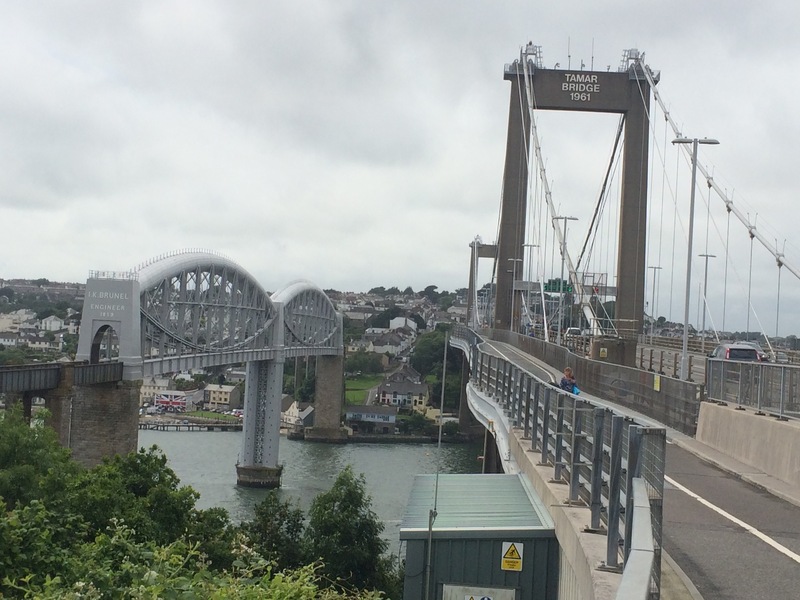 After that I caught the bus back to the Tamar Bridge and walked across it into Cornwall again. 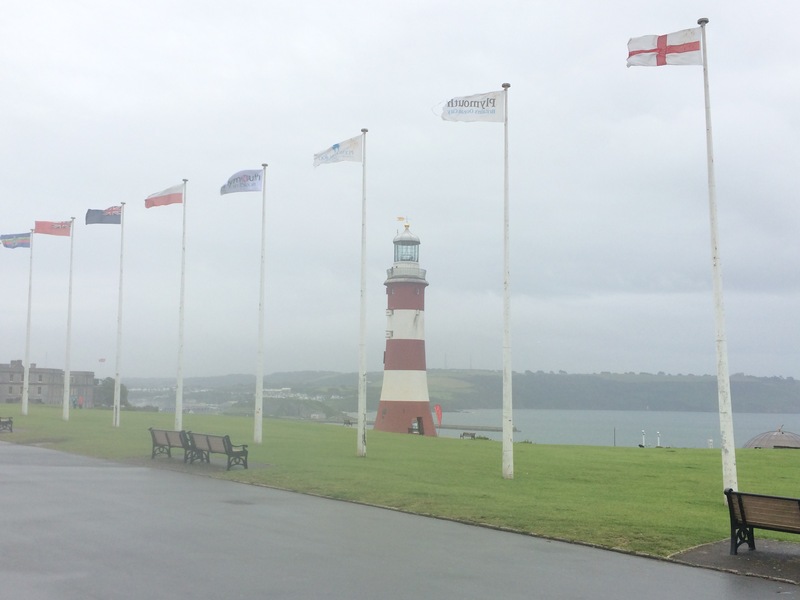 I really enjoyed my day in Plymouth. I knew it would be a long day so I got up early, packed away my wet tent and was on the road (back down the steep hill) before 8am. A quick stop at the shop in Downderry to get a banana and some croissants for breakfast and then I was on my way. 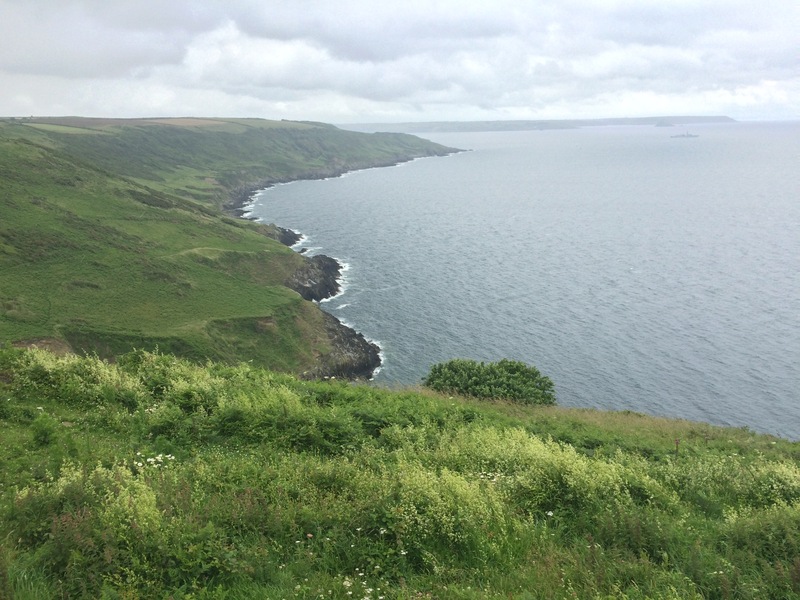 It wasn’t raining (yet) but the ground was very wet and the cliff paths were overgrown. 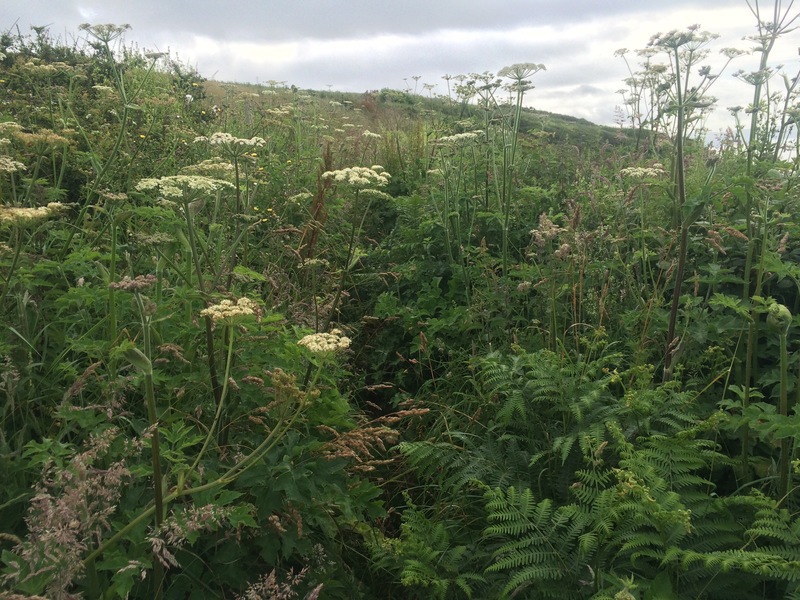 This meant I had to force my way through saturated ferns, nettles and other plants. I was soaked through from my waist down in no time. 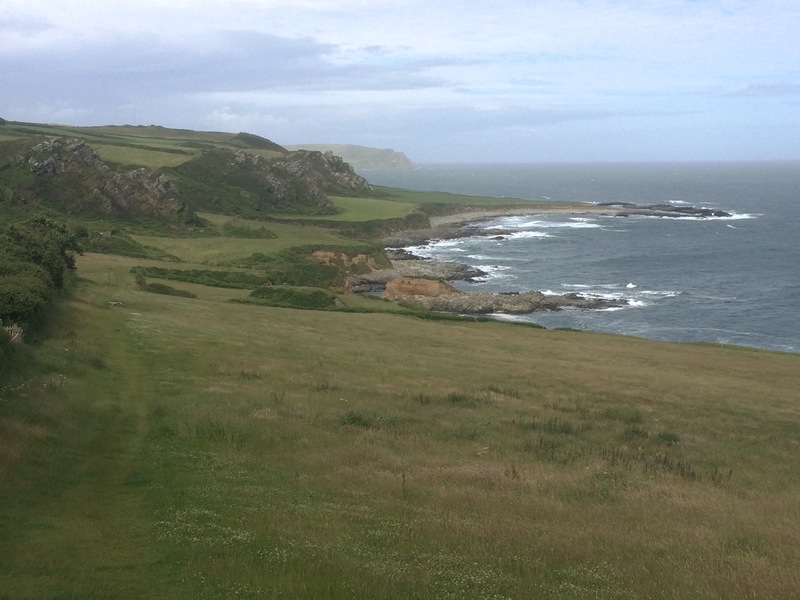 the path…it is there, honest! 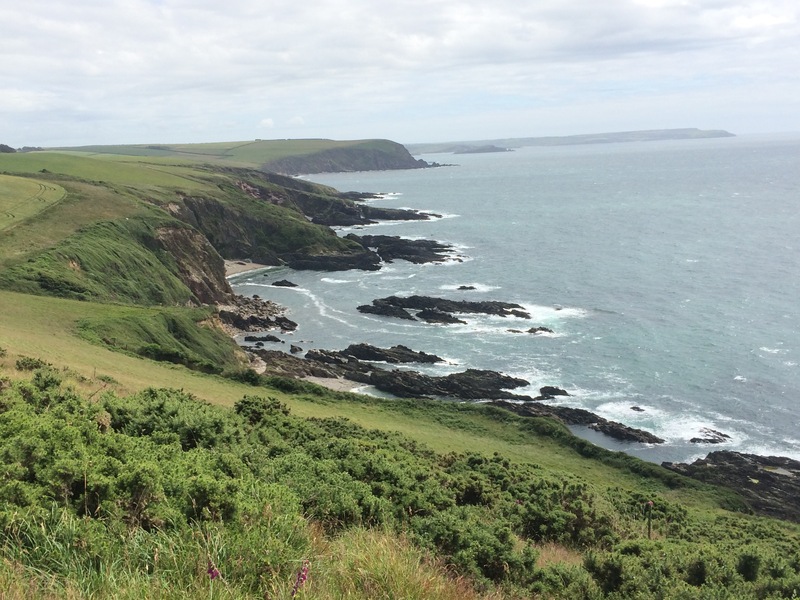 The vista across the sea was expansive and the cliffs had a peaceful air about them. 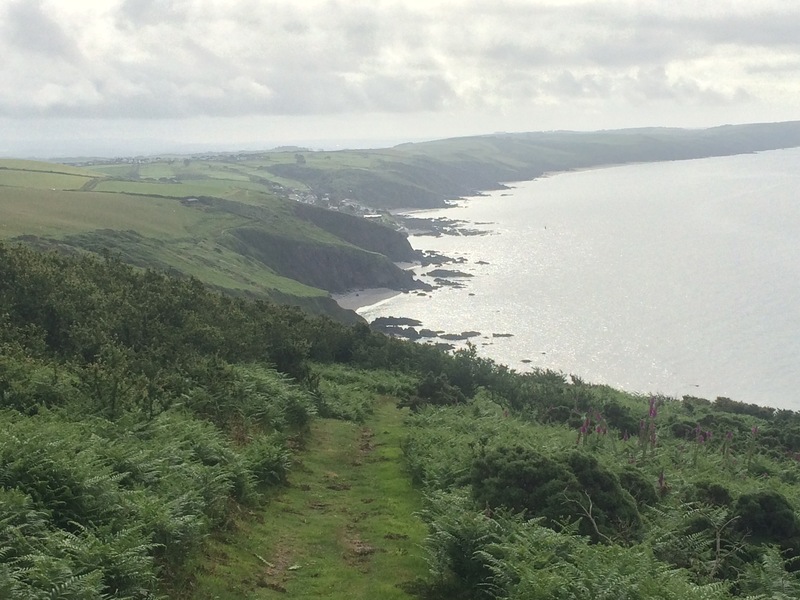 I passed through Portwrinkle and kept going. 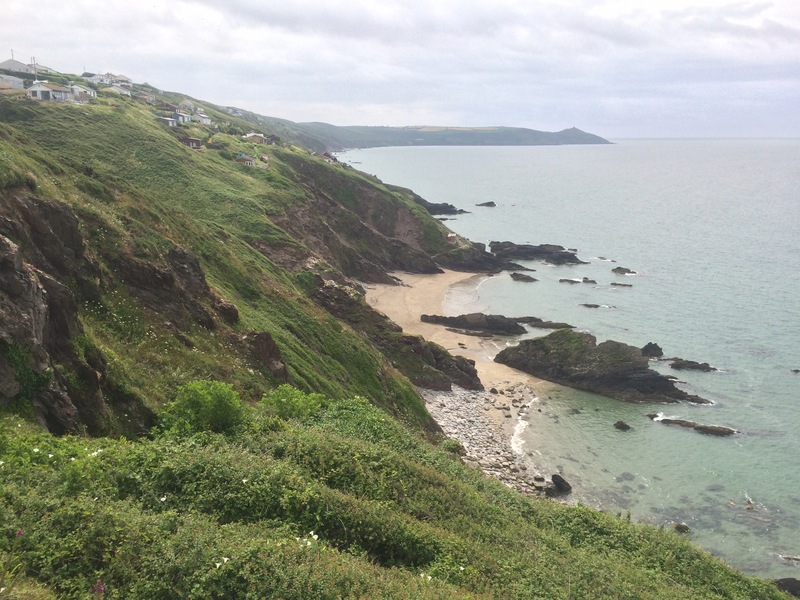 At low tide, Whitsand Bay has a 4-mile long beach at the base of steep cliffs; however, the tide was high and so there were just small sandy coves. 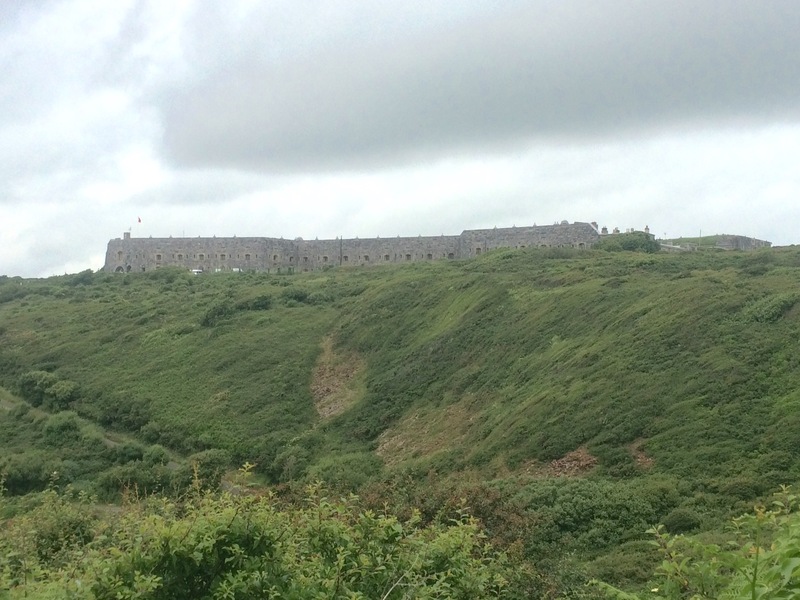 Tregantle Fort is quite imposing, built in 1865 as part of Lord Palmerston’s deterence against a possible French attack it dominates the cliff. It is still used as a firing range and the red flags were flying today so I had to walk around it on the road. 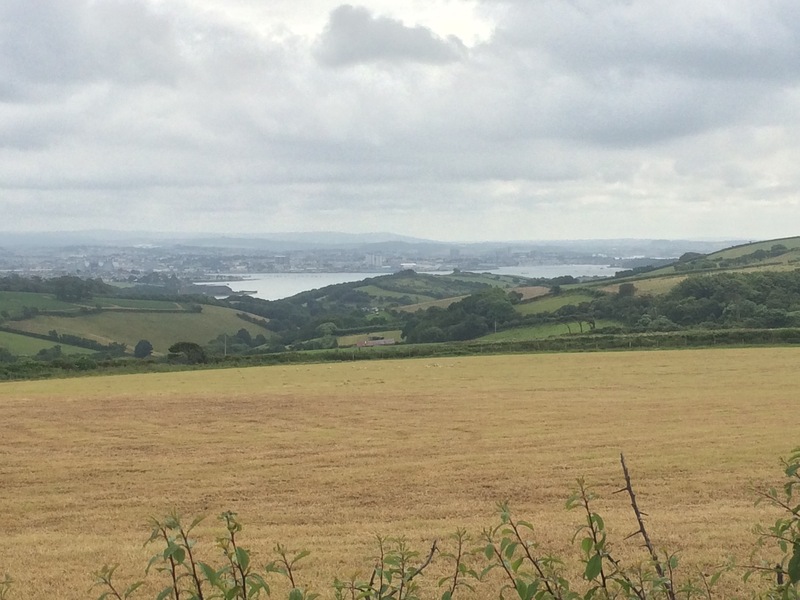 Suddenly there was a drop off to my left and, across the fields, I could see Torpoint and the River Tamar. 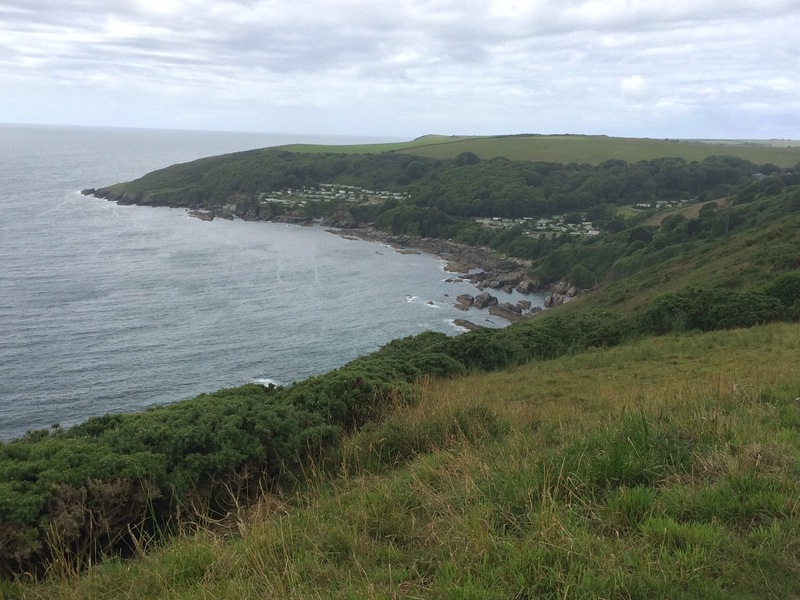 Back on the cliff top I passed through Freathy and Tregonhawke, two communities of small chalets built all over the cliff. It reminded me a bit of the chalets I saw in the dunes in Northumberland. 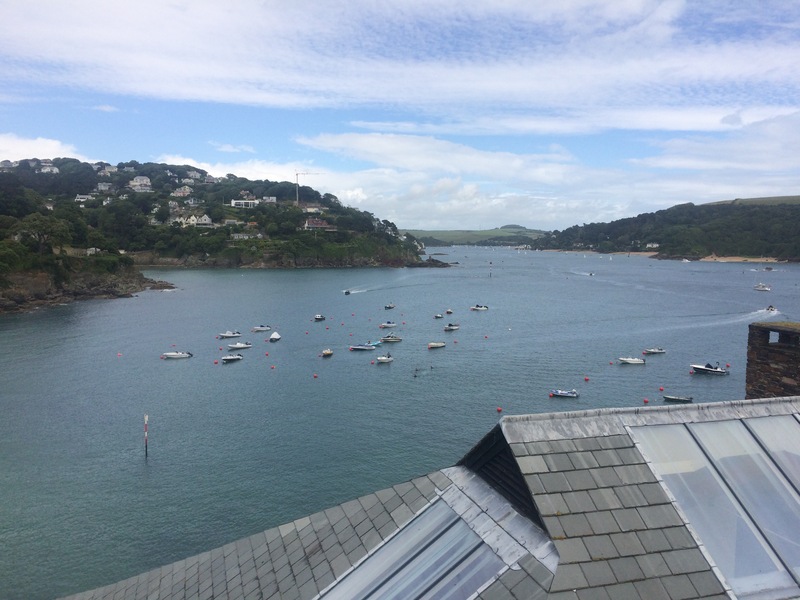 They must make amazing holiday homes with cracking sea views. 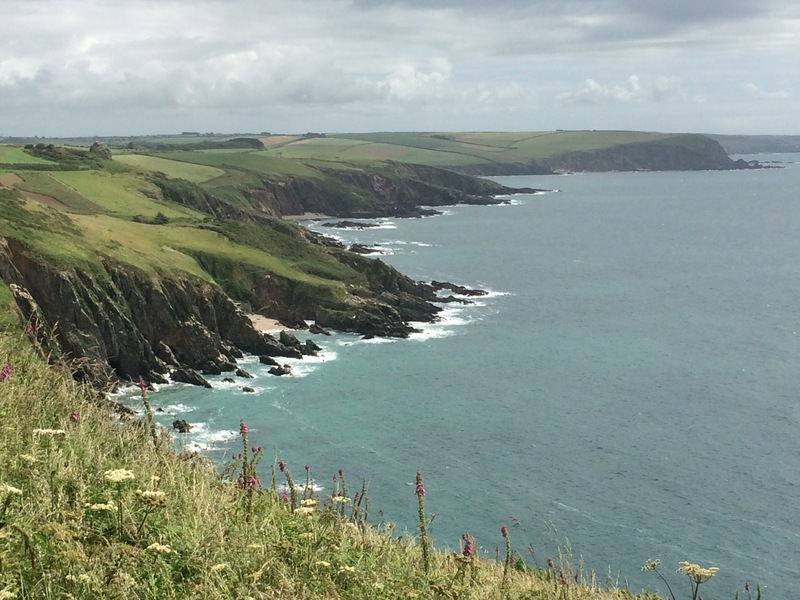 I stopped briefly for a bacon and egg butty at the Cliff Top Cafe in Tregonhawke, and to prepare myself for the rain. When I left it was raining hard and the sea mist was coming in. 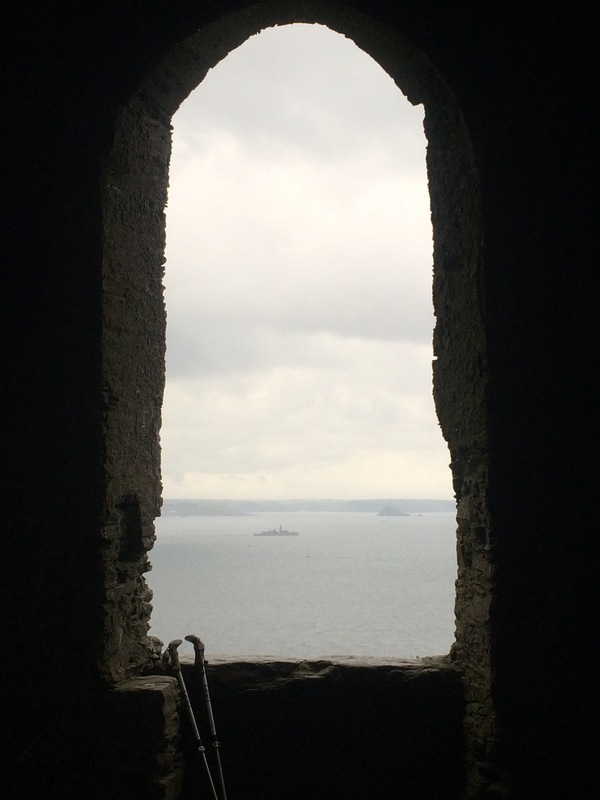 I made it to the ruined chapel on Rame Head just in time to see a couple of the Royal Navy’s Frigates leaving port. Within a few minutes they had disappeared completely in fog. I was soaked through and being blown around in the wind that had suddenly picked up; I was loving it. 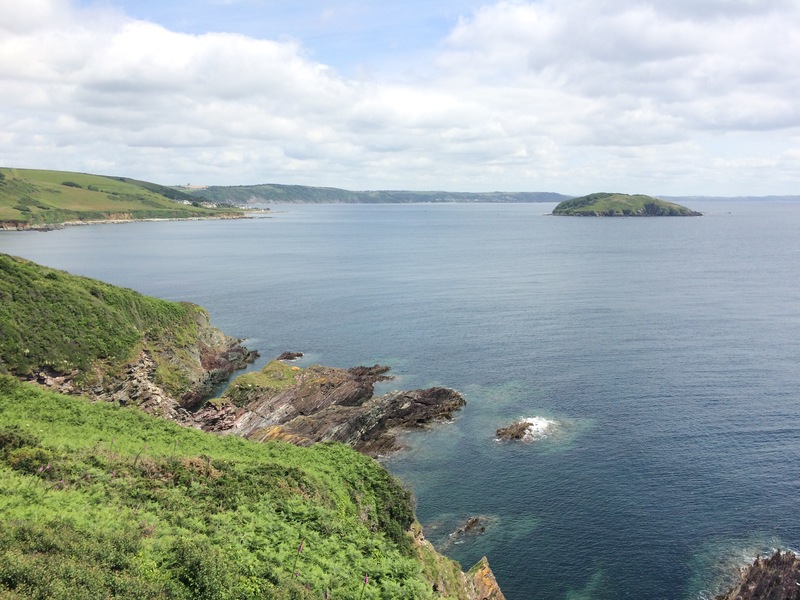 Unfortunately I couldn’t see anything as I rounded Penlee Point and then the path headed through woods to the town’s of Cawsand and Kingsand (they have totally merged together so I’ve no idea when I left Cawsand and entered Kingsand even though the Devon and Cornwall border used to split them). 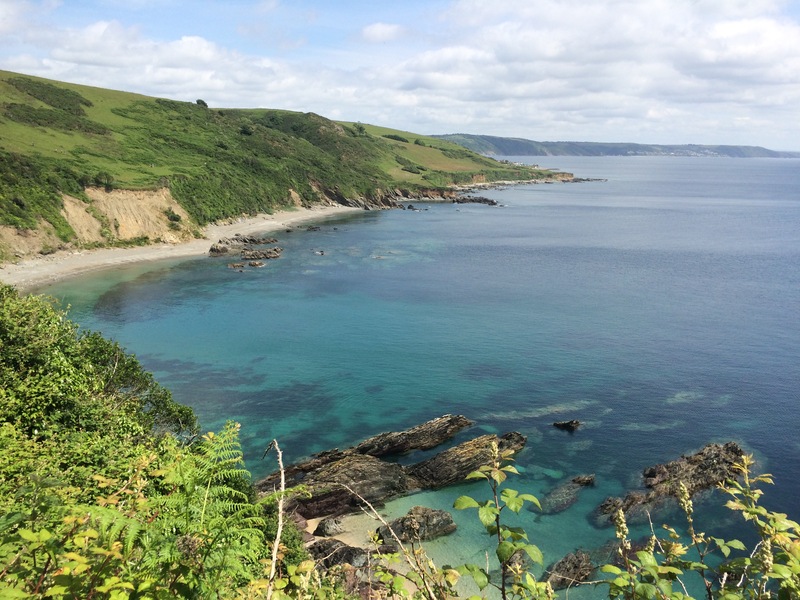 The coastline around Rame Head and Penlee is littered with purposely sunk wrecks creating artificial reefs and dive sites that have been colonised by over 270 marine species. 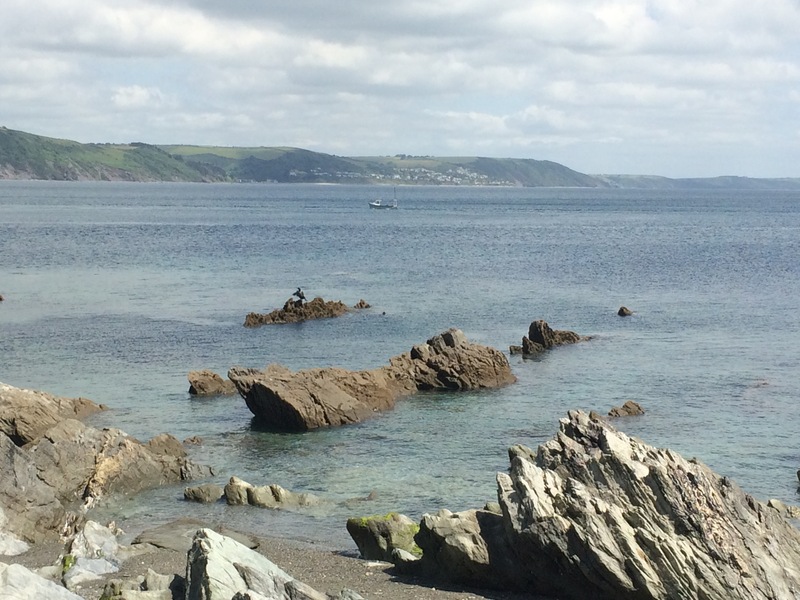 A local couple I’d met on the cliff had told me I should stop at The Old Bakery in Cawsand, so I did. There were 3 other wet walkers already in the cafe. I dried off over coffee and some of their wonderful, home baked, sourdough bread. 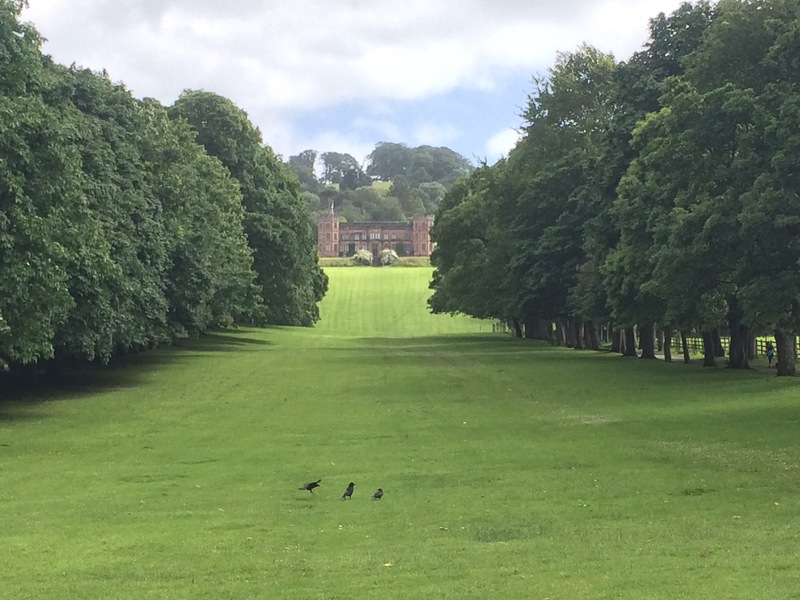 After an hour sheltering the rain stopped and the sun came out for the last section through Mount Edgcumbe Country Park. 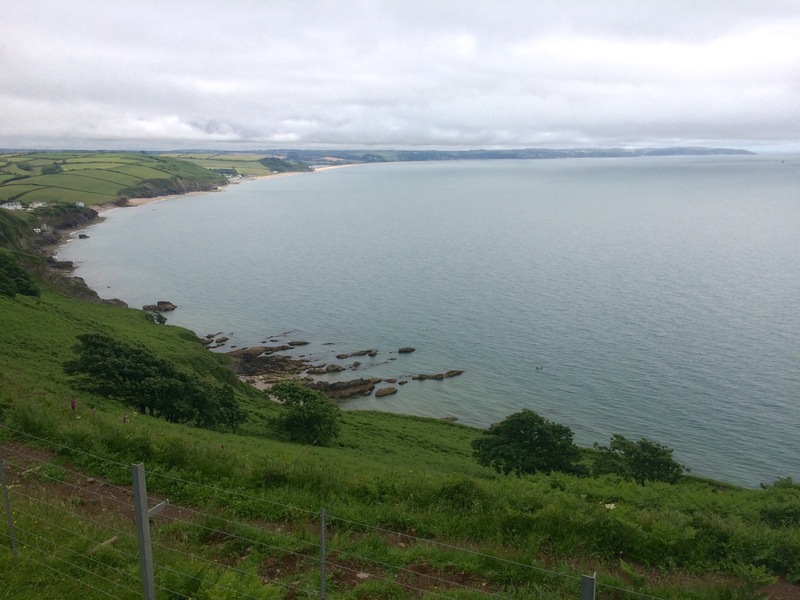 The first section of this walk was through a wonderful woodland around Picklecombe Point I got wet again anyway from the dripping trees. 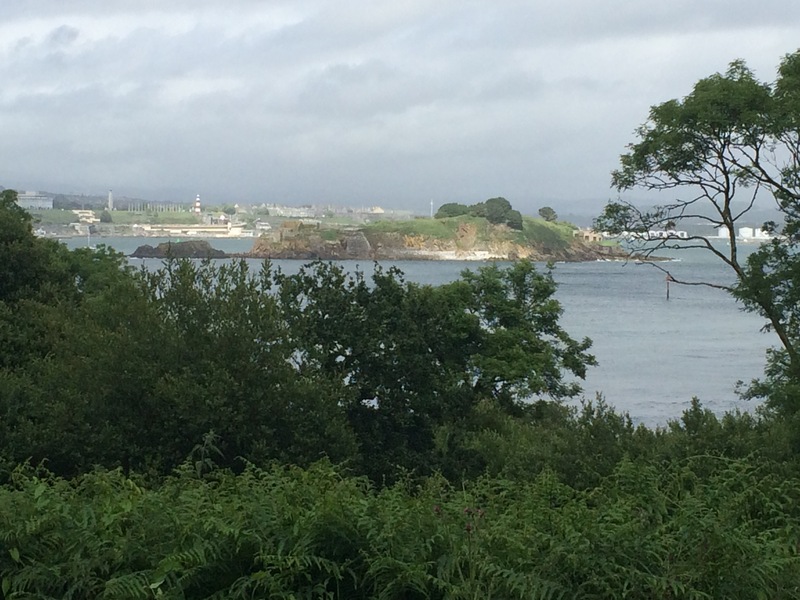 At a couple of points there were amazing views out from the trees across Plymouth Sound. 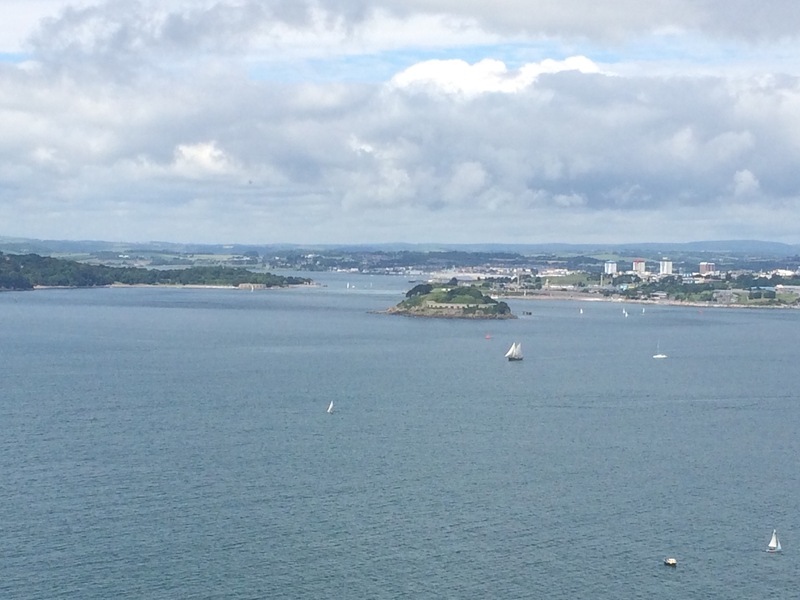 I could see the Plymouth Breakwater and across to Staddon Point Fort, as well as Drake’s Island in the middle of The Sound. 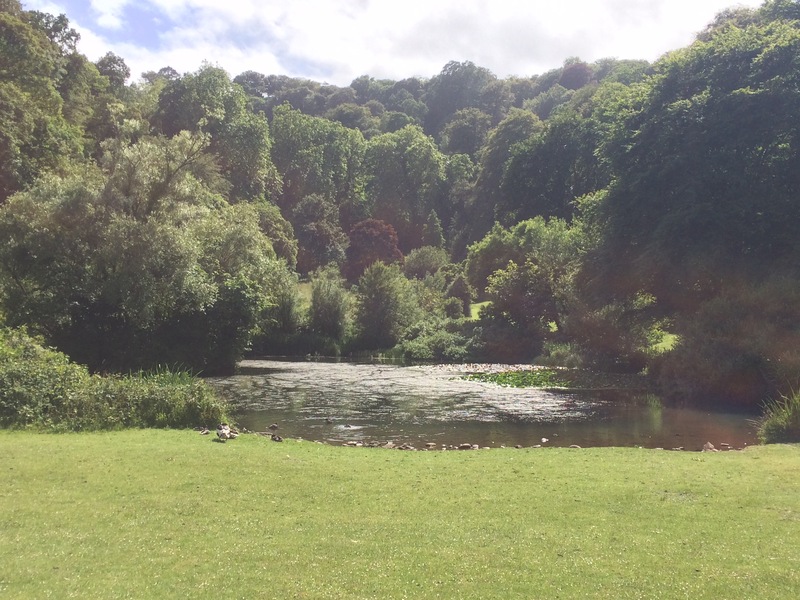 Mount Edgcumbe has wonderful historic gardens that were originally planted in the 18th Century but neglected after they were bombed in 1941 and then rescued in the 1970s. Amongst the gardens are ones with plants from the following nations: England, France, Italy, America and New Zealand. 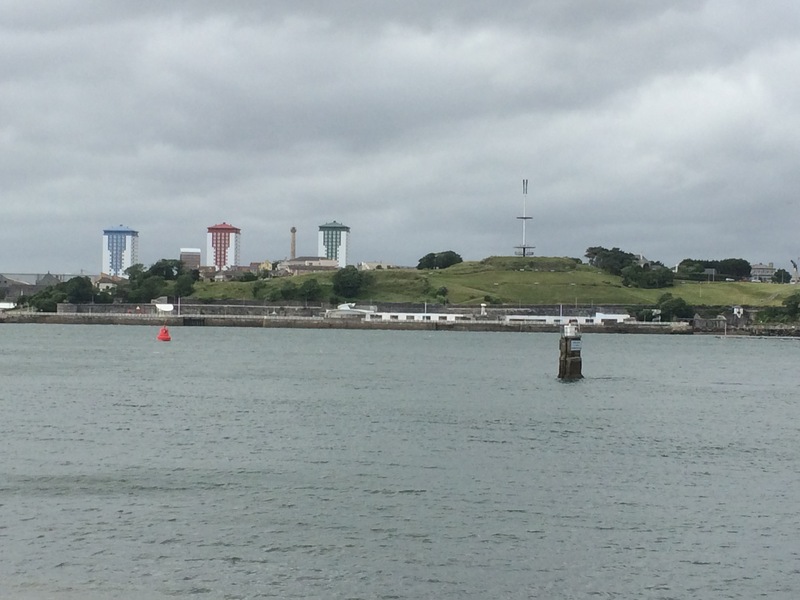 I didn’t take a tour around the gardens but stayed on the periphery And walked past all the fortifications with views across The Sound. 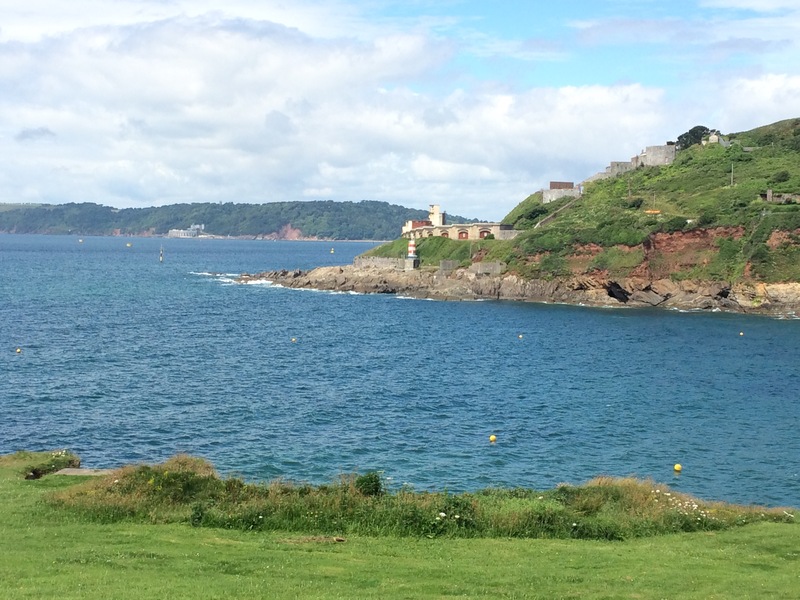 Mount Edgcumbe Park is also renowned for its Camellia collection. 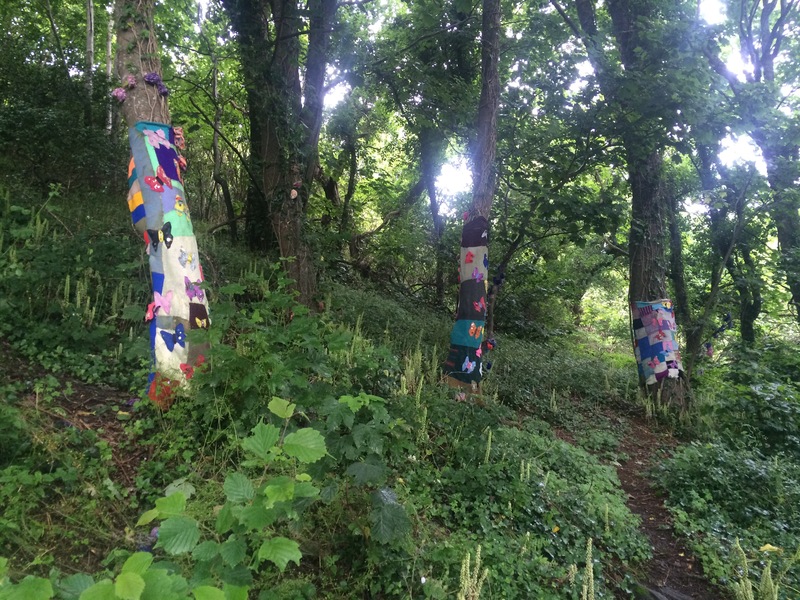 The trees certainly did look wonderful. 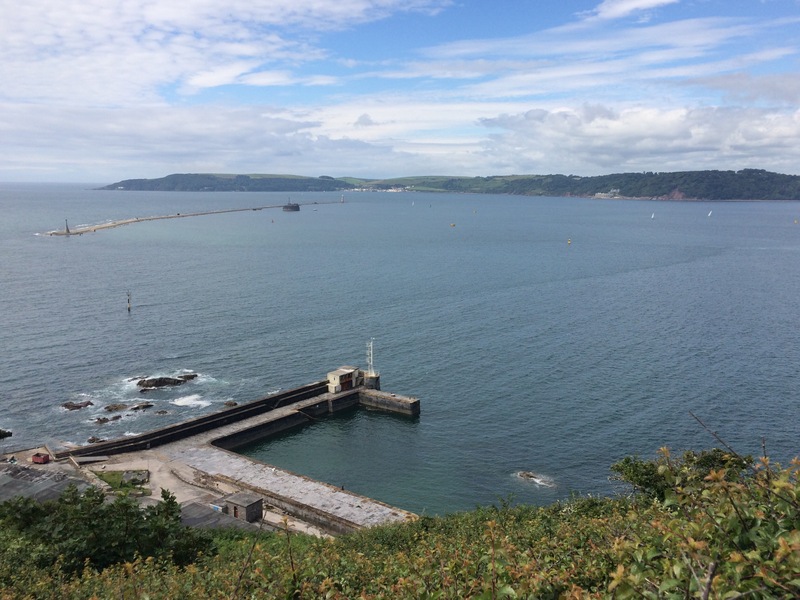 Since Tregantle Fort I had passed a further 4 military installations: Polhawn Fort near Rame Head, Picklecombe Fort at Picklecombe Point and a Blockhouse and Garden Battery within Mount Edgcumbe Country Park. 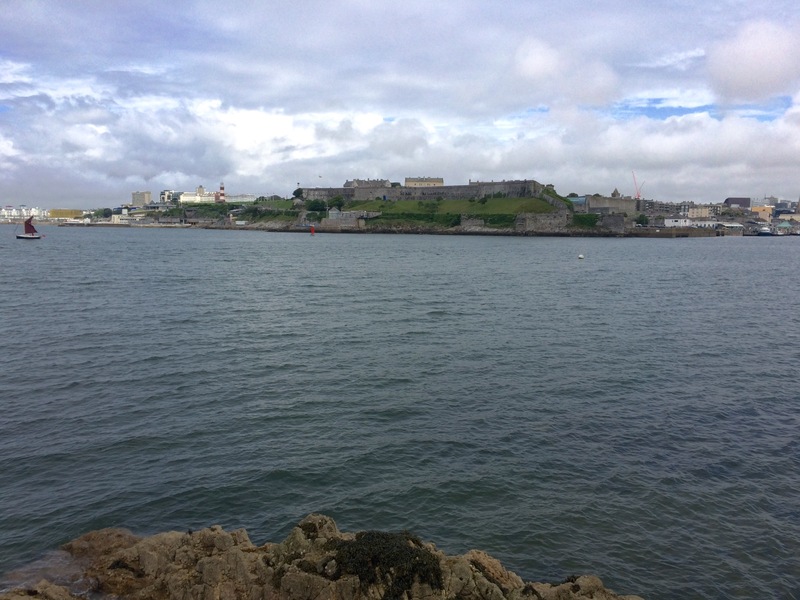 I could also see The Citadel at the entrance to Plymouth’s Barbican Wharves, and forts at Durnstone Point and Staddon Point across The Sound. 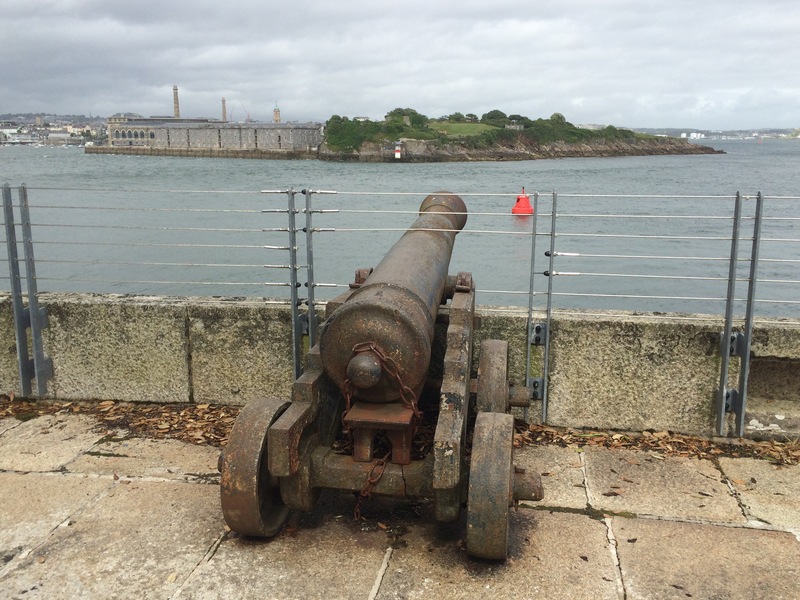 I came to the conclusion that Plymouth has long been a significant port to be so well protected. 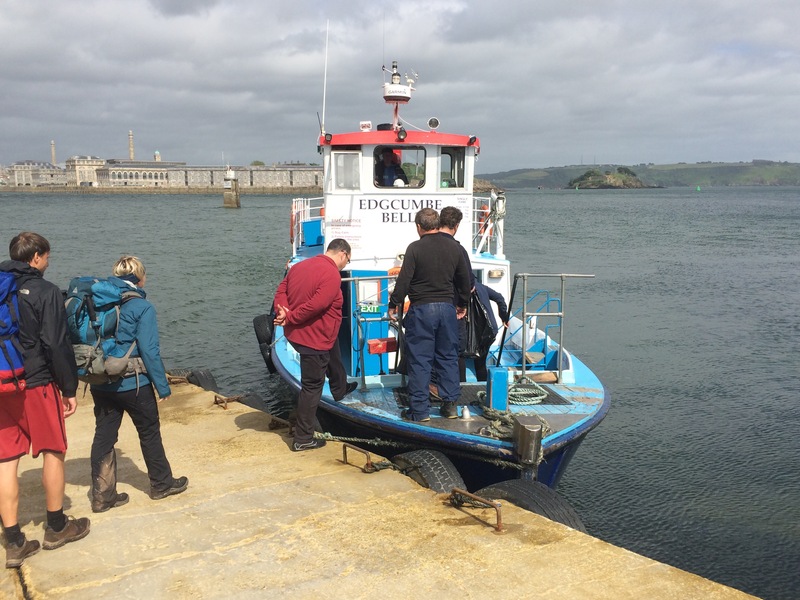 The Cremyll Ferry took me across the River Tamar to the Stonehouse area of Plymouth. 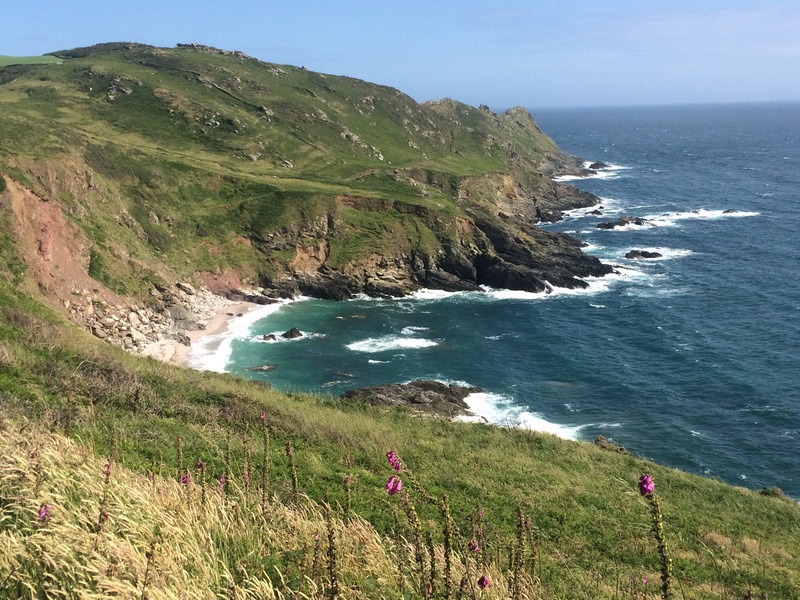 I had finally made it around Cornwall; it had taken me over 5 weeks, the longest time I’ve spent in any county. I think that was a combination of the walking being hard and there being too much to see and do. 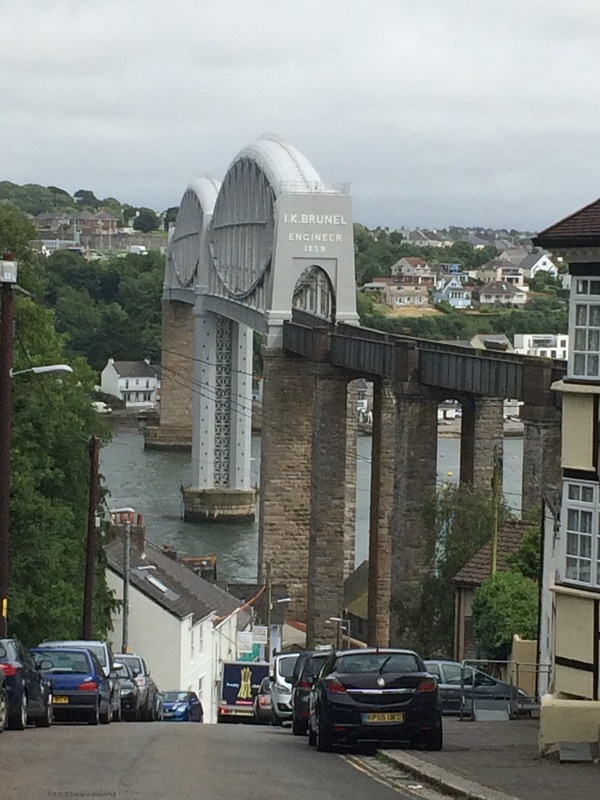 Kerry picked me up and promptly drove me back across the Tamar Bridge into Cornwall (is there no escape?) 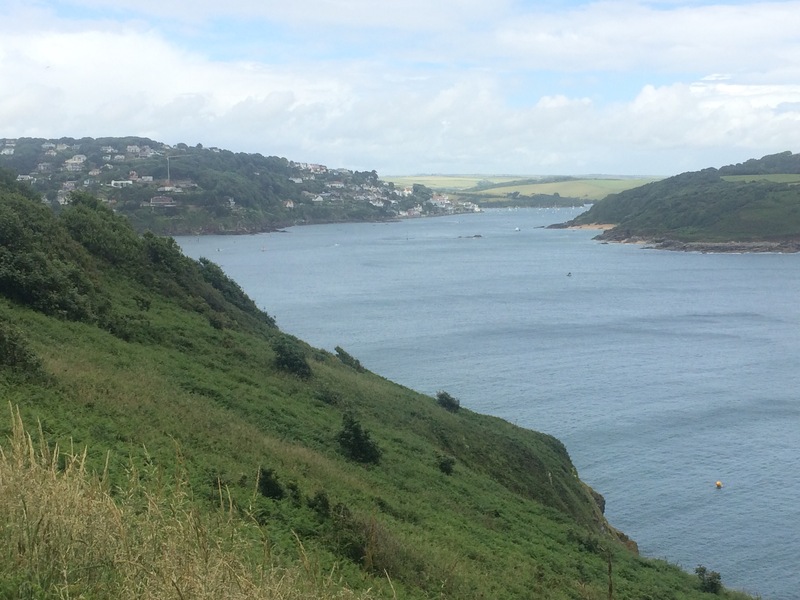 to Saltash. I was incredibly grateful for a bed for the night. It was sunny again this morning. My day began with collecting the eggs to make my breakfast. Wonderful. I had lots of admin to do and hung around with Jane for most of the morning, taking advantage of her wifi. Eventually, as today was supposed to be the best weather for the week, I decided I had to get going. I had been invited to stay an extra day and it was very tempting. 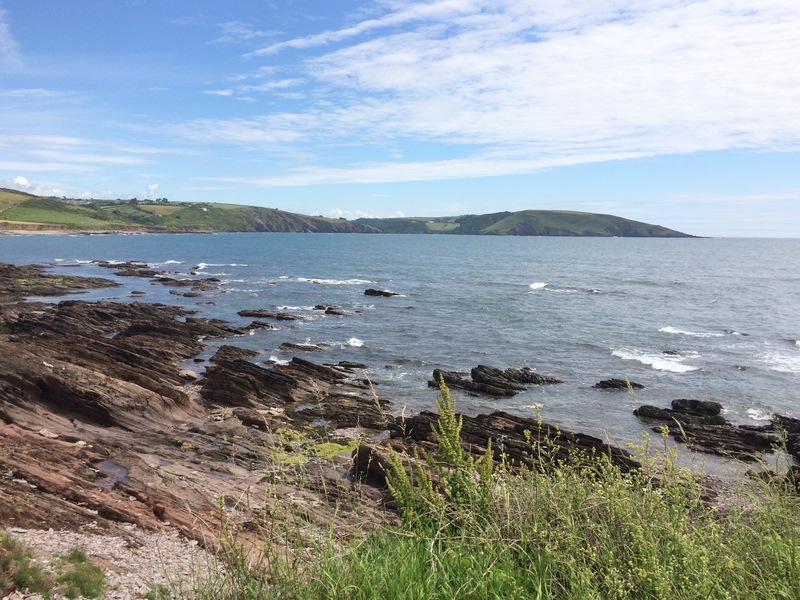 I could actually see Talland Bay today; it has lovely red rocks that extend underwater into the bay. 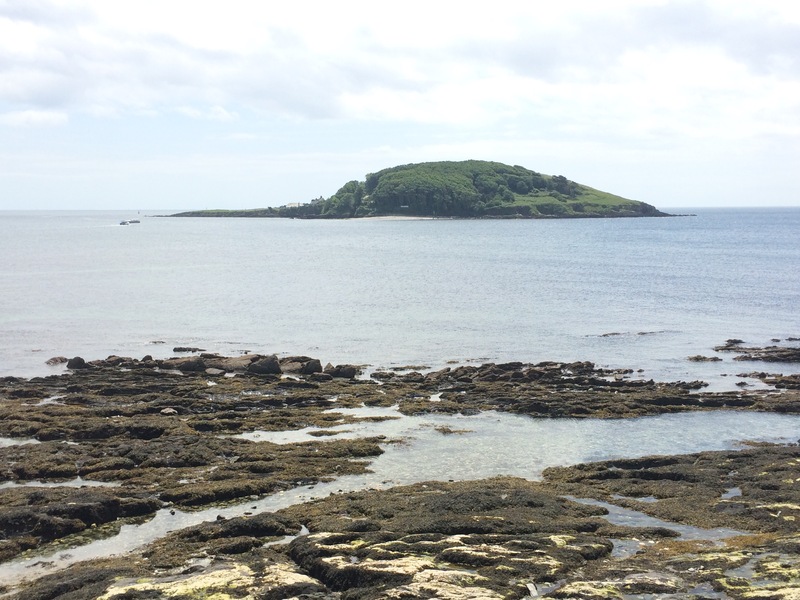 It didn’t take long to walk to Looe and I had great views of Looe Island as I walked around Portnadler Bay. 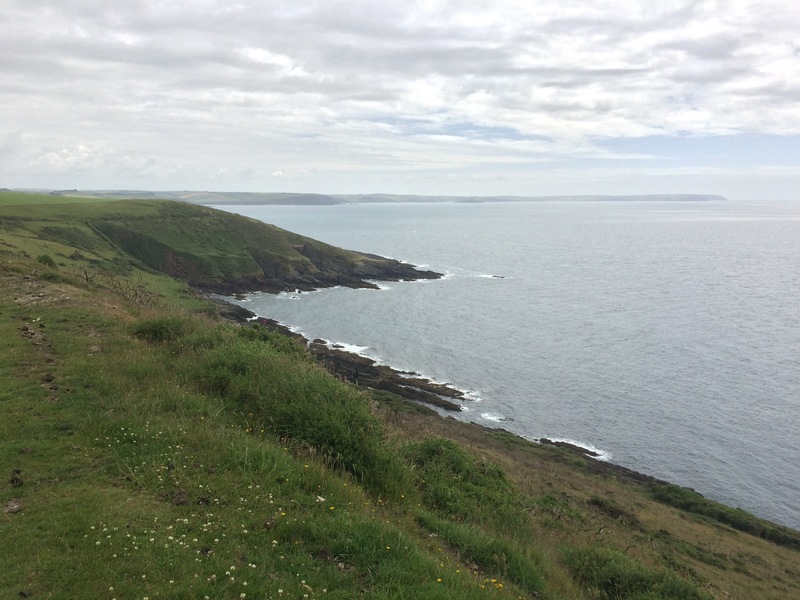 The island is a nature reserve and was bequeathed to Cornwall wildlife trust in 2004 by the Atkins sisters. 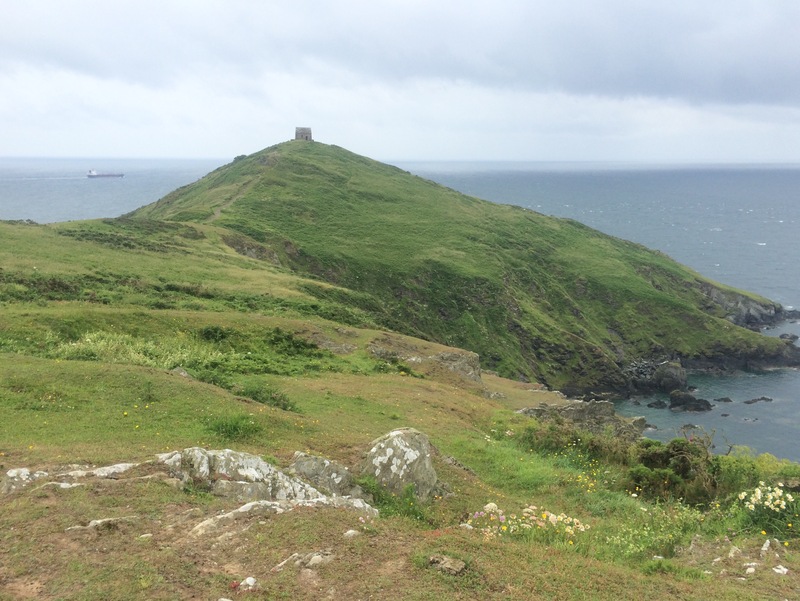 It is also a marine nature reserve and a chapel which, legend has it, Joseph of Arimethea came to visit. Yet again the sea was the most beautiful colour, a deep blue and very clear. 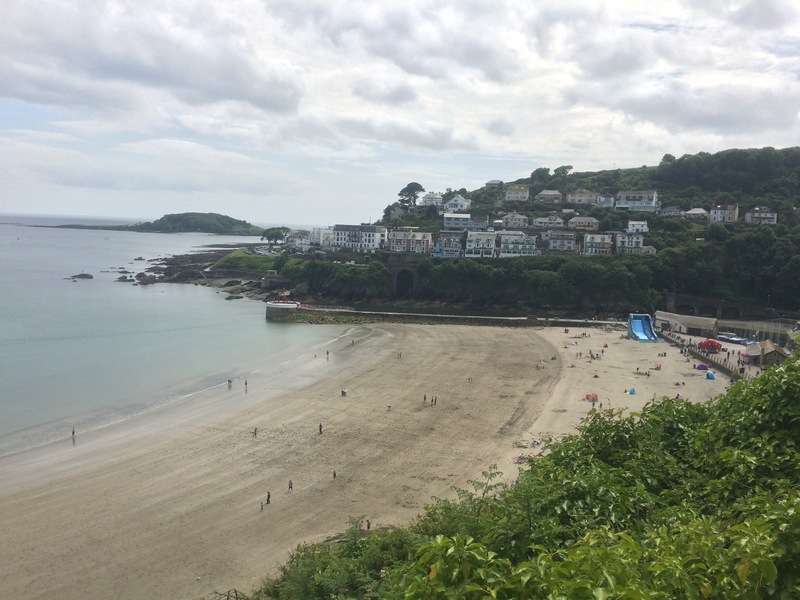 Looe is a town of two halves; West and East. 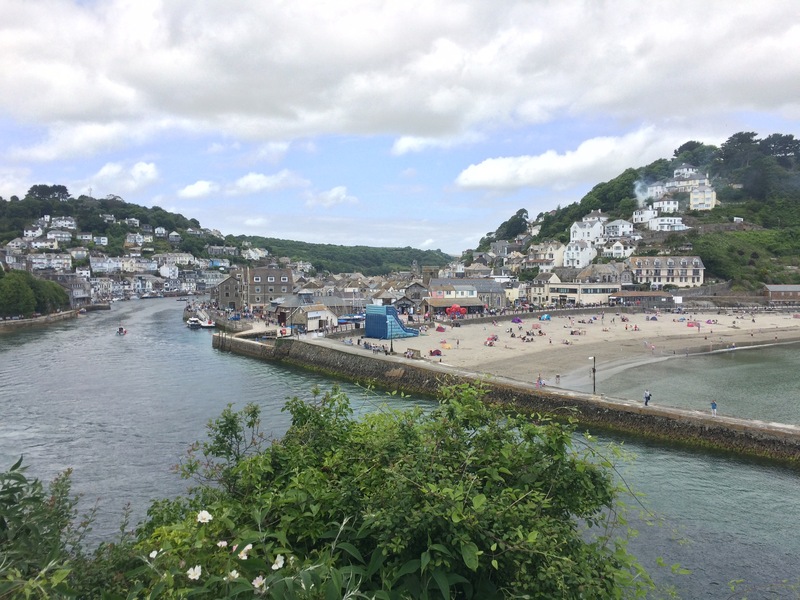 They were once individual towns and are physically separated by a river that splits into two; the West Looe River and the East Looe River. It would have been easy to walk across the bridge; however, I preferred to pay 50p to cross the river by ferry. 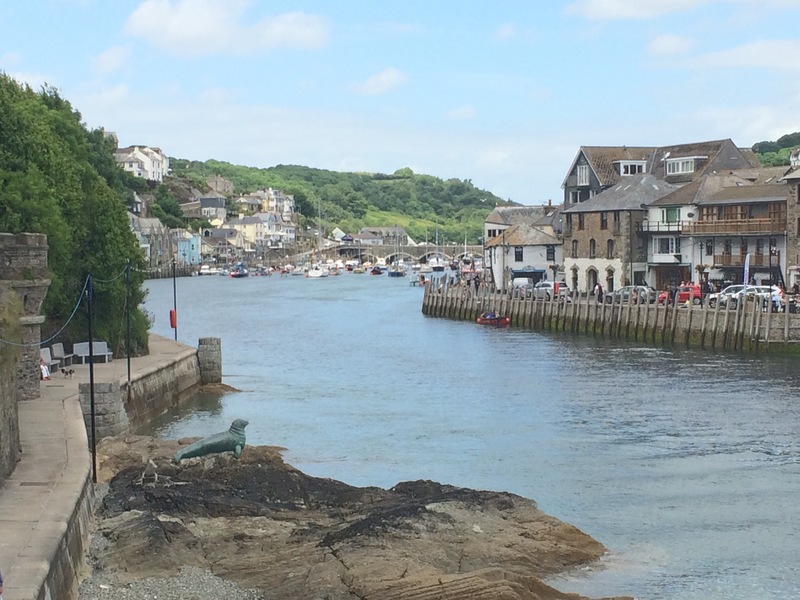 On the edge of the river in West Looe there was a bronze statue of Nelson, a one-eyed bull grey seal who lived around Looe Harbour and Island for many years before he died in 2003. It’s funny what captivates people. 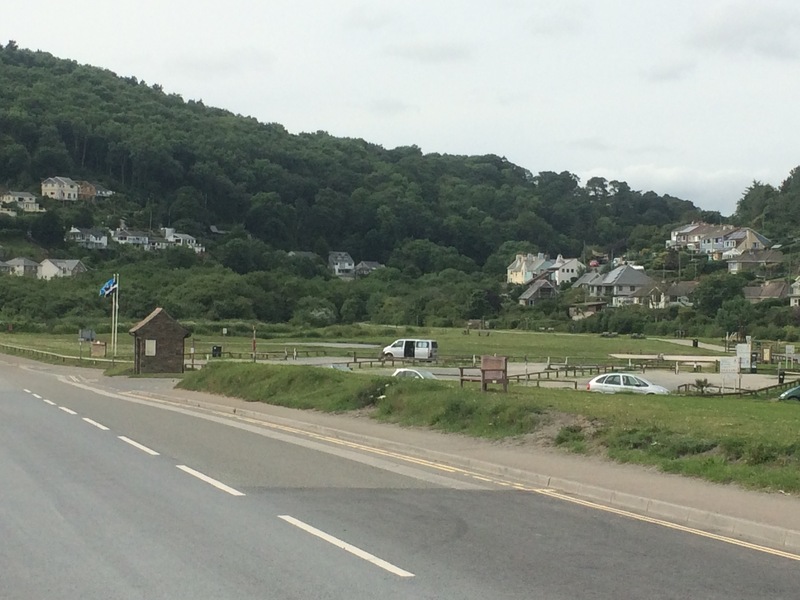 Three separate people, including Jane the food blogger, had recommended Sarah’s Pasties in Looe. 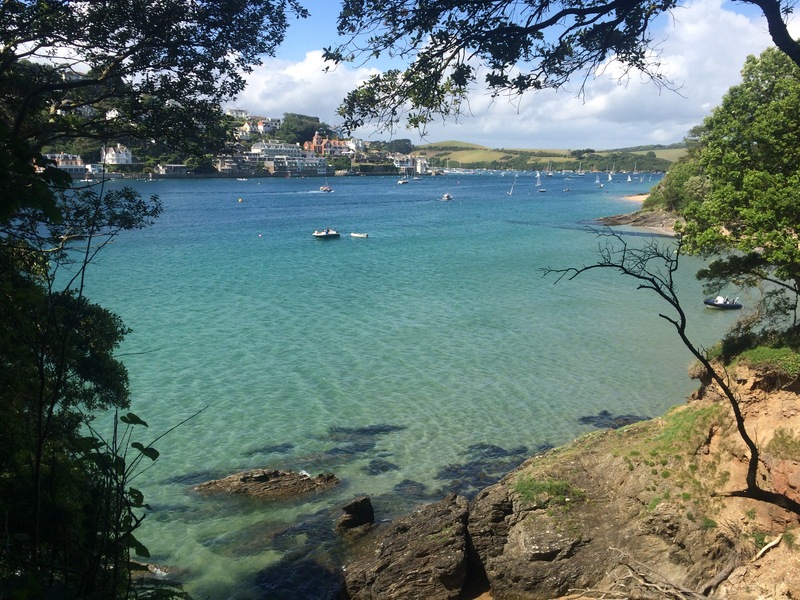 Apparently the best in Cornwall (and therefore the World). I can’t describe how gutted I was to find the shop had sold out of pasties before I got there at lunchtime. I went and drowned my sorrows in coffee at The Lookout Cafe instead. 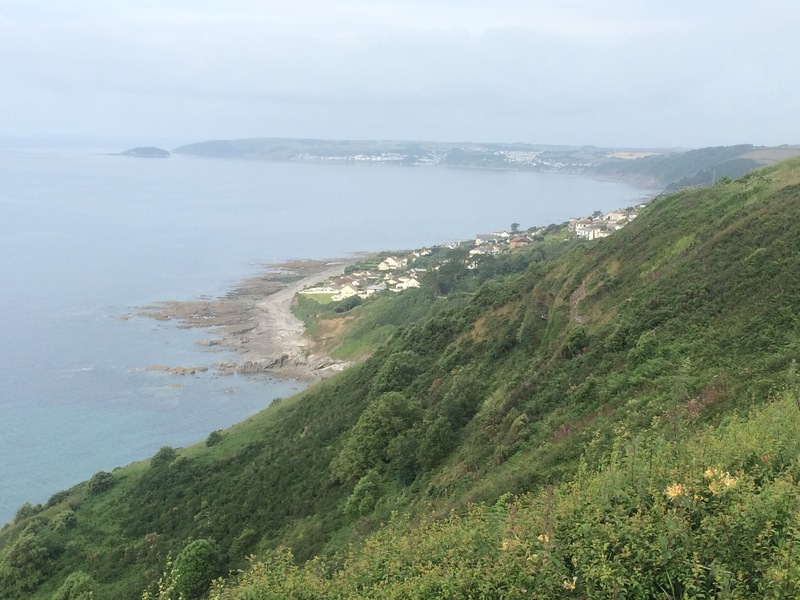 It was a steep climb out of Looe to the large houses that line the cliff heading to Mildendreath. One driveway had two Bentleys and a boat in it. 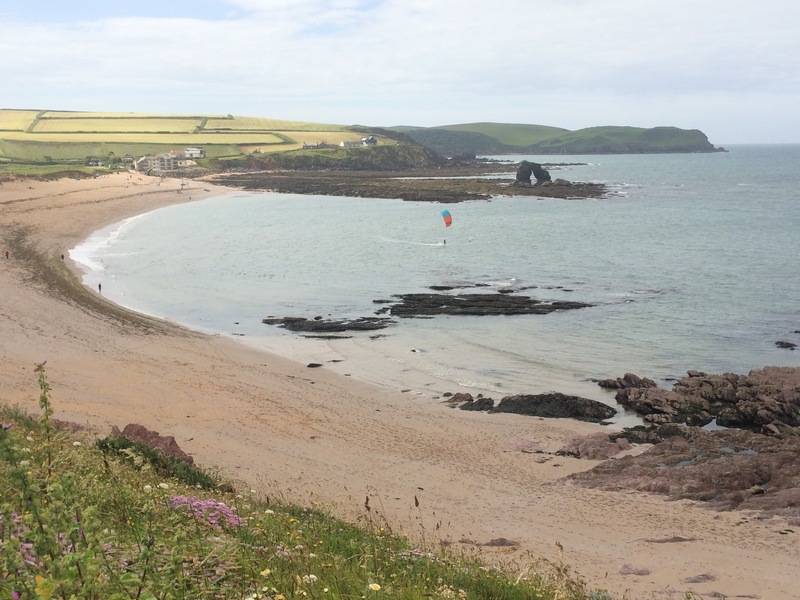 Mildendreath Beach seemed to be almost exclusively for residents of the Black Rock Beach Resort. The sand here had changed from yellow to a darker colour, more grey. 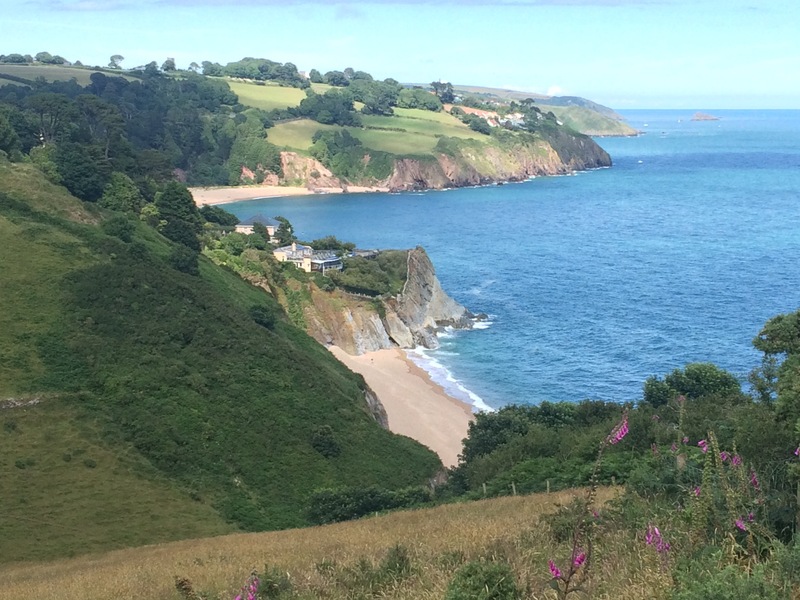 The cliffs on the way to Seaton had lots of houses and pine trees. Very nice, quiet, suburbia. 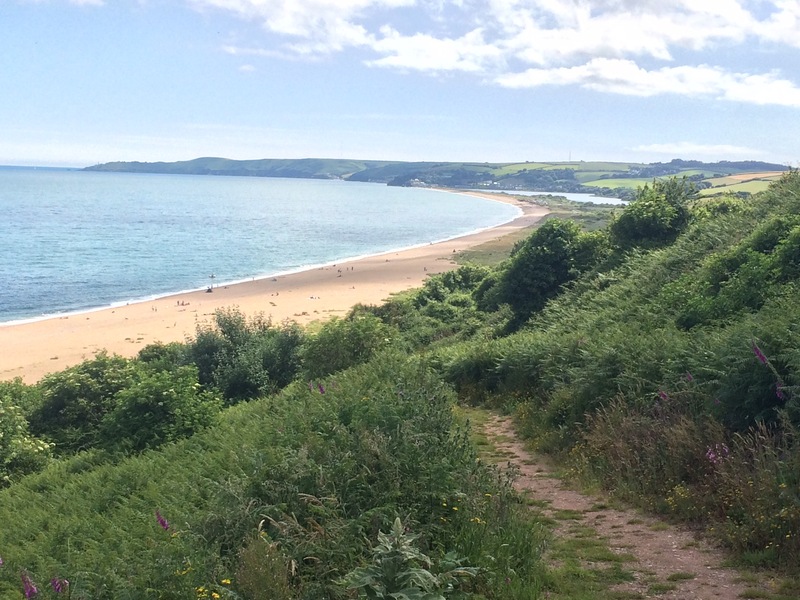 Seaton had another ‘grey beach’ with the Seaton River that ran out of the Seaton Valley Countryside Park and across the beach. 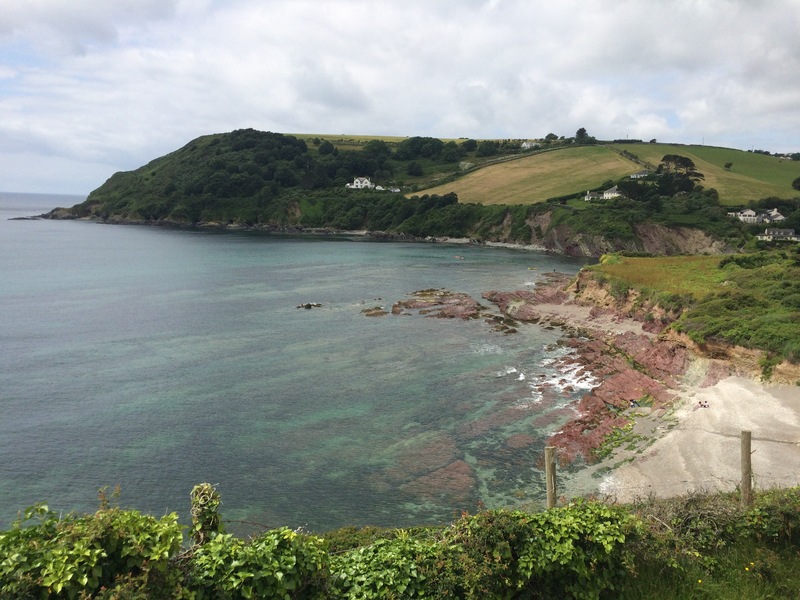 Seaton merged in Downderry and here the houses had lovely views across the sea but it seemed like every other one was for sale or being rebuilt. 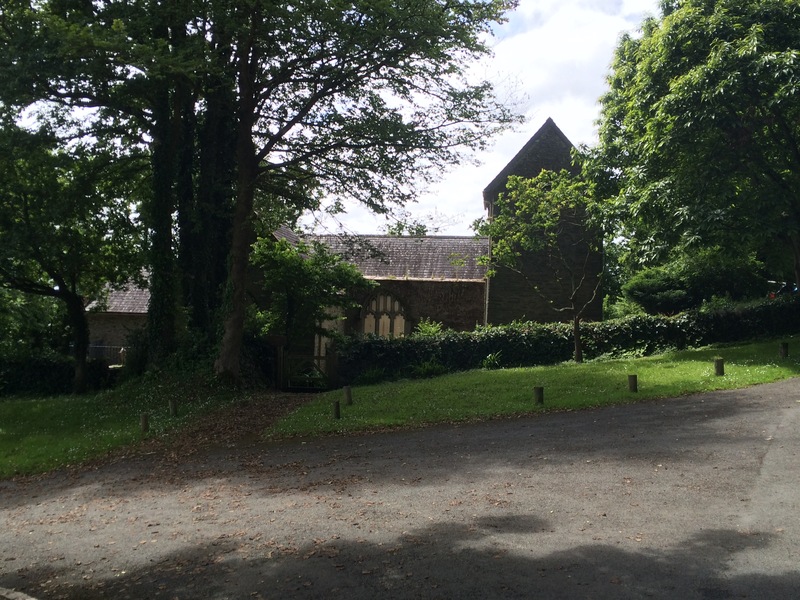 There were 2 campsites in Downderry and I chose the one at the top of a mega-steep hill. The other one was a naturist camp! My campsite was very basic, and it was a long walk back down the hill to the Inn on the Shore for dinner. I did wonder (only for a second) if I should have chosen the other campsite.